This is a case of unselfish sewing, surprising though it may be. 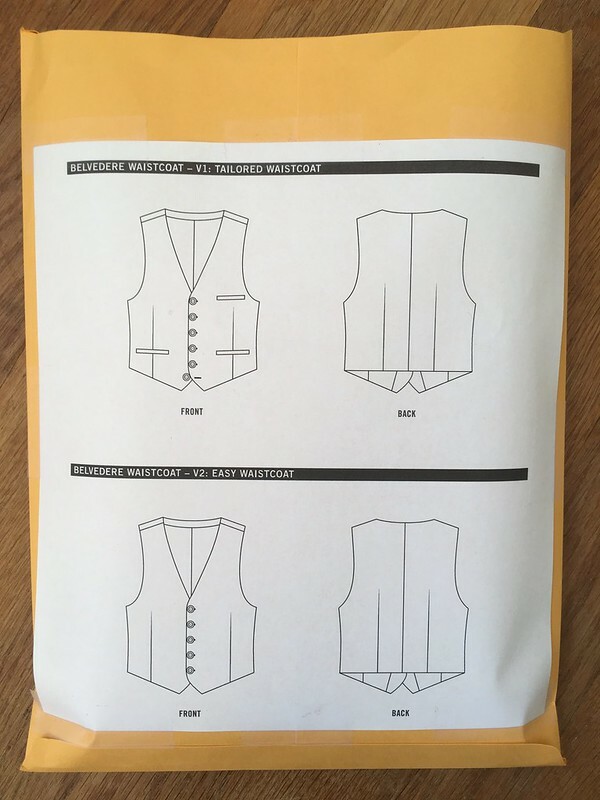 😉 Today’s project is the Belvedere Waistcoat (vest) from Thread Theory Designs. 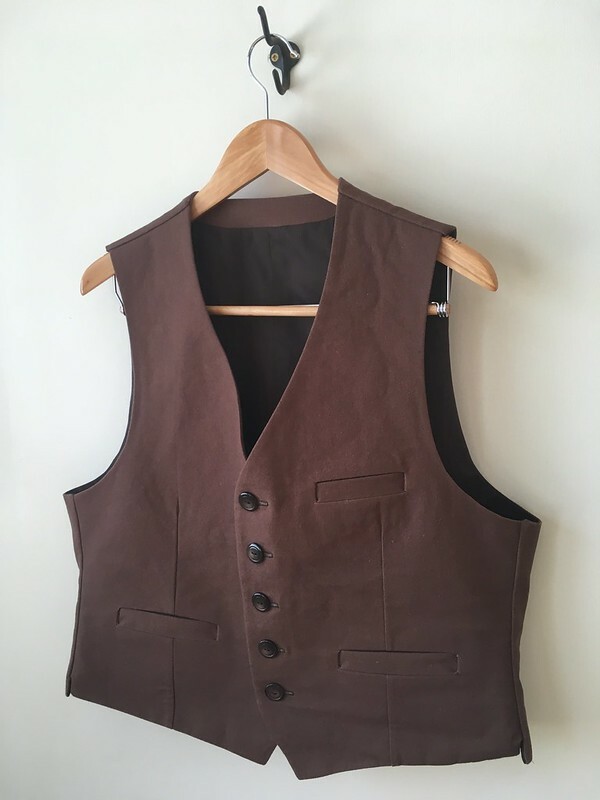 I made this vest for my husband before Christmas, and we were both very happy with how it turned out. 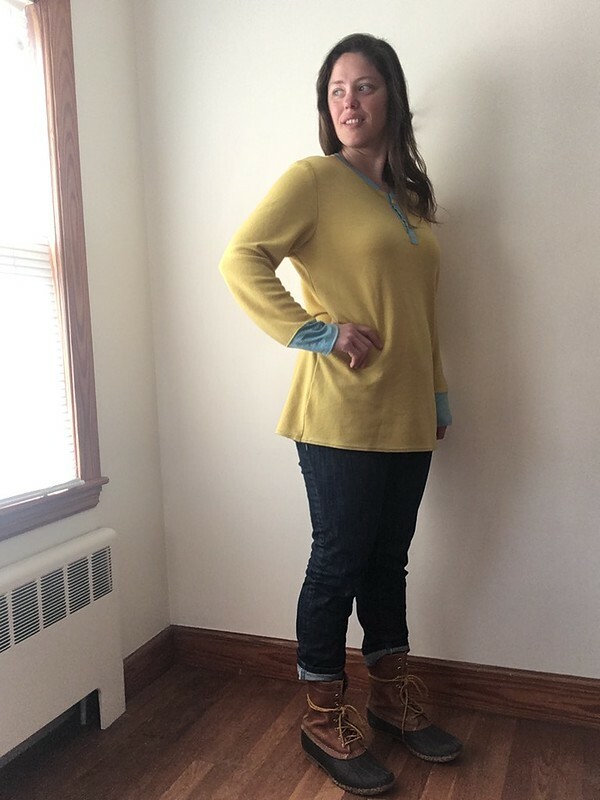 In buying this pattern, I broke one of my norms, and bought a PDF pattern, which is not my preference, but after looking around at the available patterns, and even buying a Vogue pattern, we realized that this was the one my husband really wanted. At this point, it is only available as a PDF. 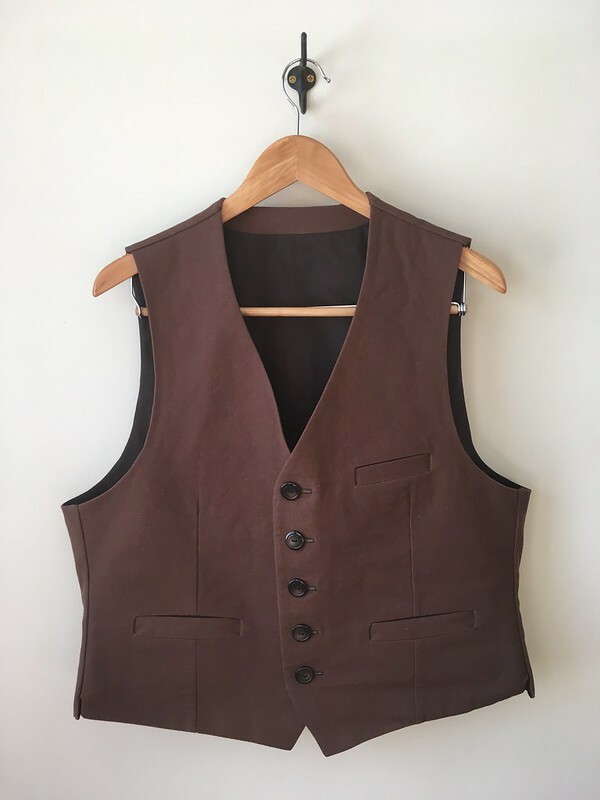 This is a great pattern because there are two options: an easy waistcoat, and a tailored waistcoat, so if you are a beginner or are looking for a quick vest pattern, you’re covered. 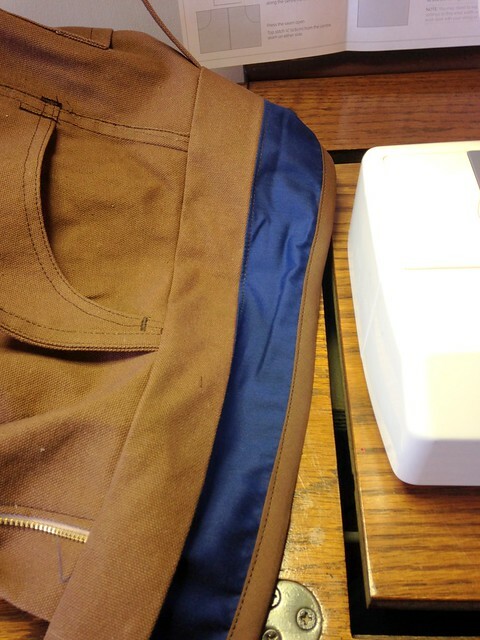 If you want to delve deeper and try your hand at something involving tailoring, welt pockets, etc., you’re also covered. 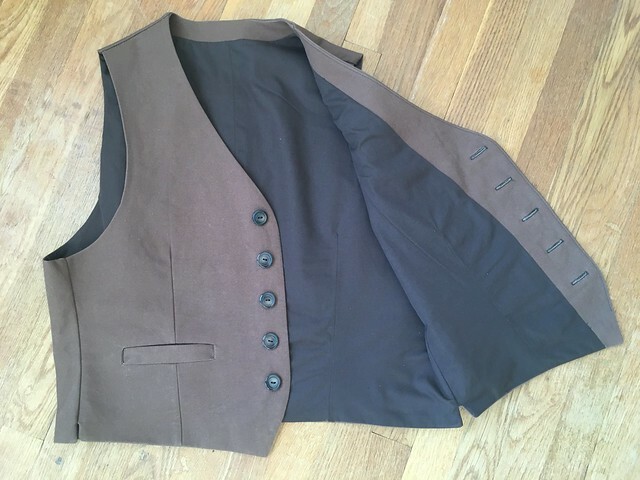 We were inspired to use canvas by a friend’s vest, purchased from Historical Emporium, which is also made of canvas. 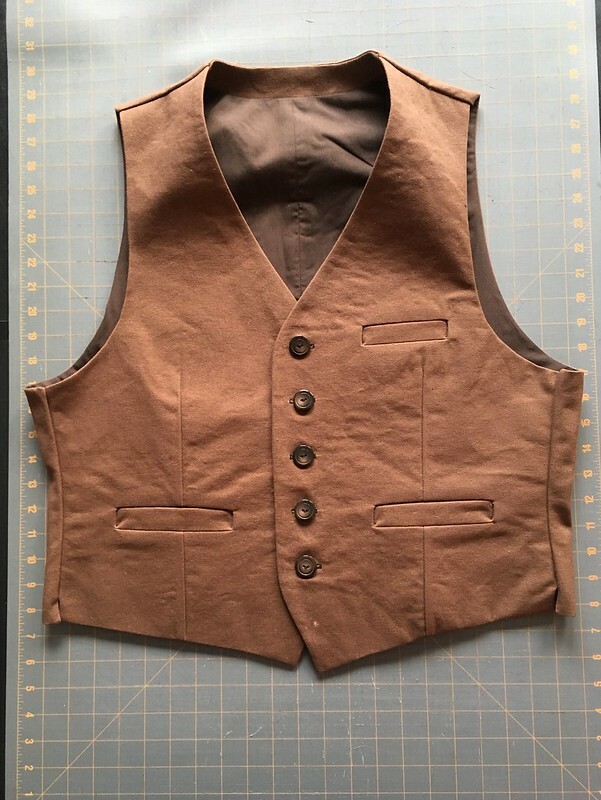 My husband isn’t very formal, so he liked the idea of a vest that was both detailed and sturdy. 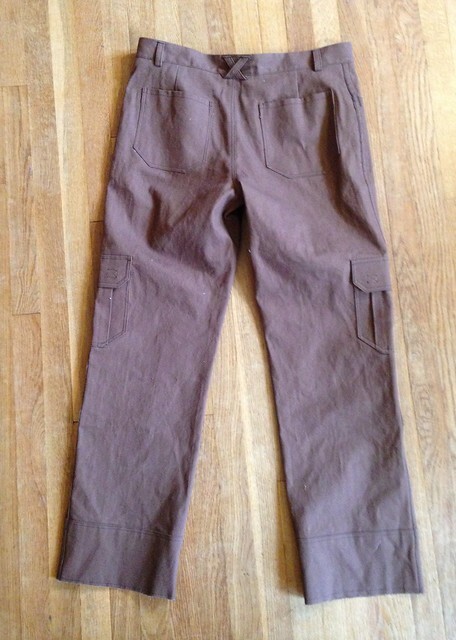 I had leftover brown duck canvas from the first pair of cargo pants I made him (Thread Theory’s Jutland Pants), and so rather than making a muslin, we decided on a wearable muslin in this fabric. 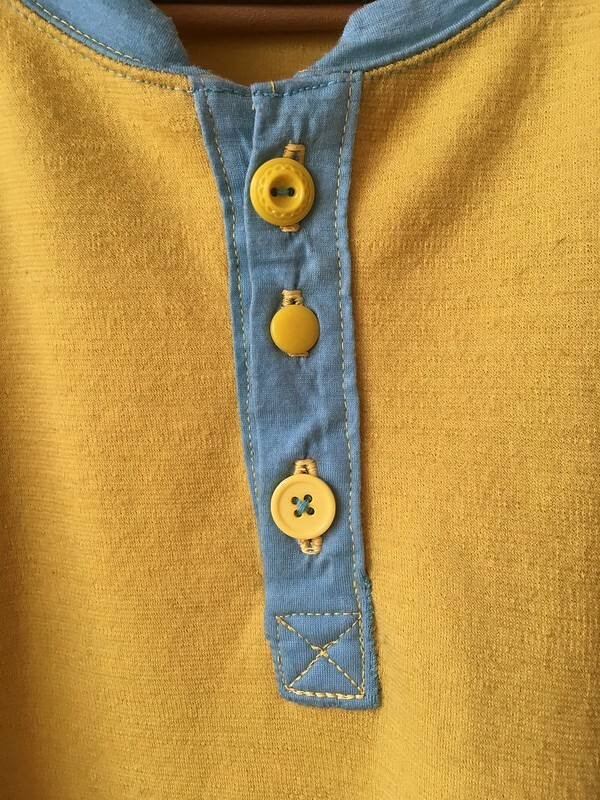 I found an inexpensive poly/cotton broadcloth at JoAnn Fabrics to use as a lining as well as the buttons I needed. We were ready! 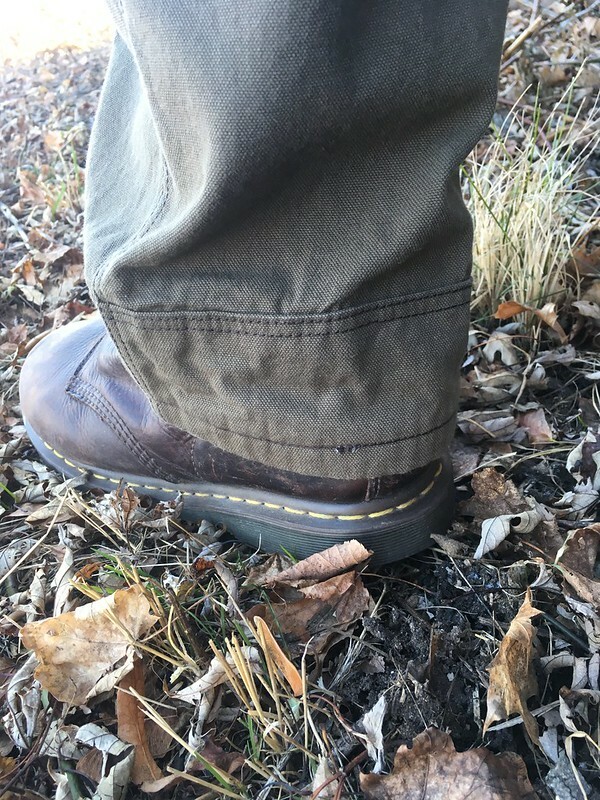 Luckily the fit was great, and the only things we would do differently next time are to lengthen the torso by two inches since he is tall with a long torso, and take a small wedge (about 5/8″) out of the center back seam, tapering it to nothing 5″ up from the bottom. Luckily the wedge adjustment was something we were able to do while this version was in progress, and it really improved the fit for him. 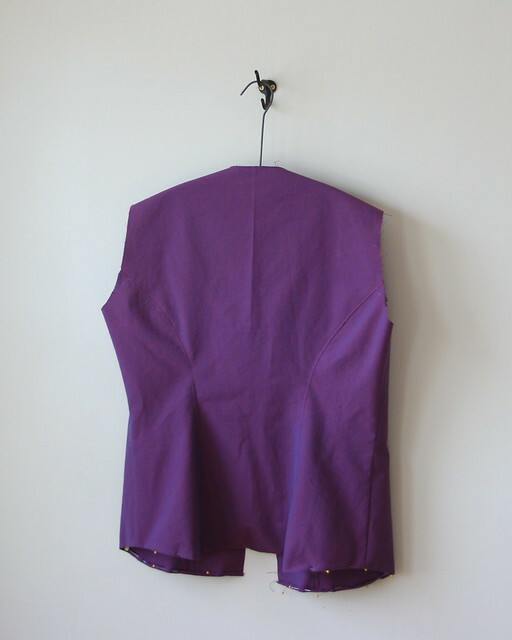 Now that I’m thinking about it, some higher quality interfacing would also be a good idea next time. Like any time I sew for someone else, I usually procrastinate a bit. I think I’m worried about the garment fitting and, in this case, I wasn’t sure how complex this pattern would be. I was happy to see that when I finally got into it, if I just followed the directions step by step, I made it through just fine. 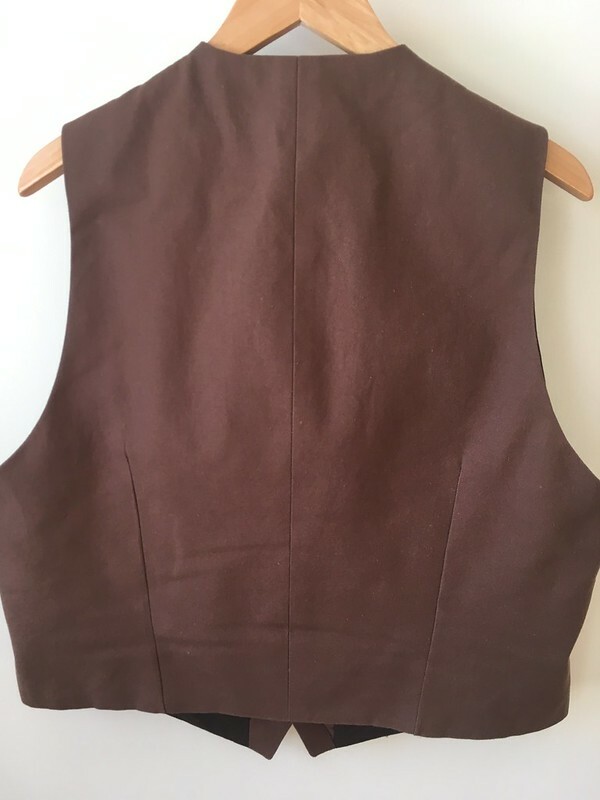 One part where I ran into a little bit of trouble (which was completely my own fault) was when I was clipping the seams where the front of the vest and the facing join. 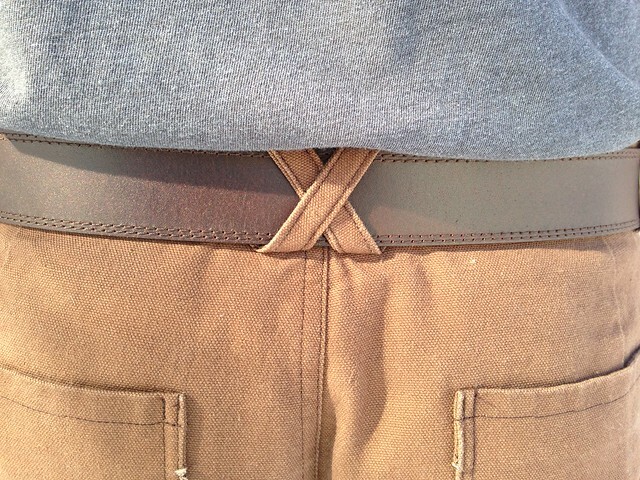 On one side I wasn’t very careful and I clipped through not only the seam allowance, but also the facing. Next time I’ll be more careful. 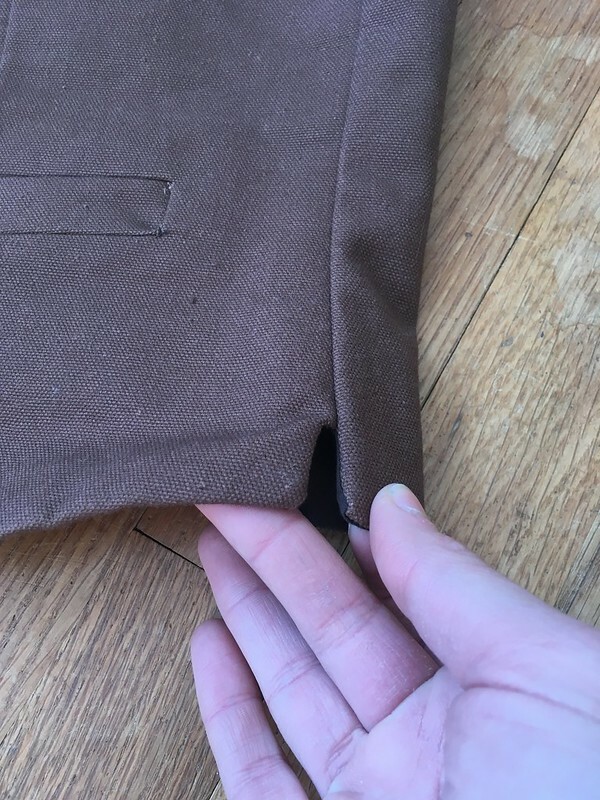 I found it helpful when making the welt pockets (which went just fine, thankfully) to use a zipper foot when sewing over the little triangle tabs at the side. This helped me get as close as possible to the base of the triangle. 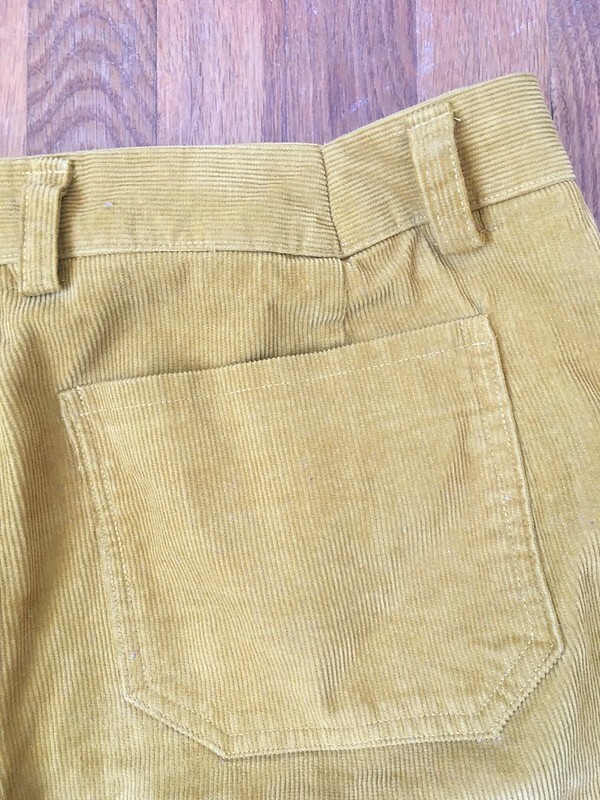 I haven’t made many welt pockets before, so I was happy with how these turned out. We also decided to add in the optional side vents, which turned out well. 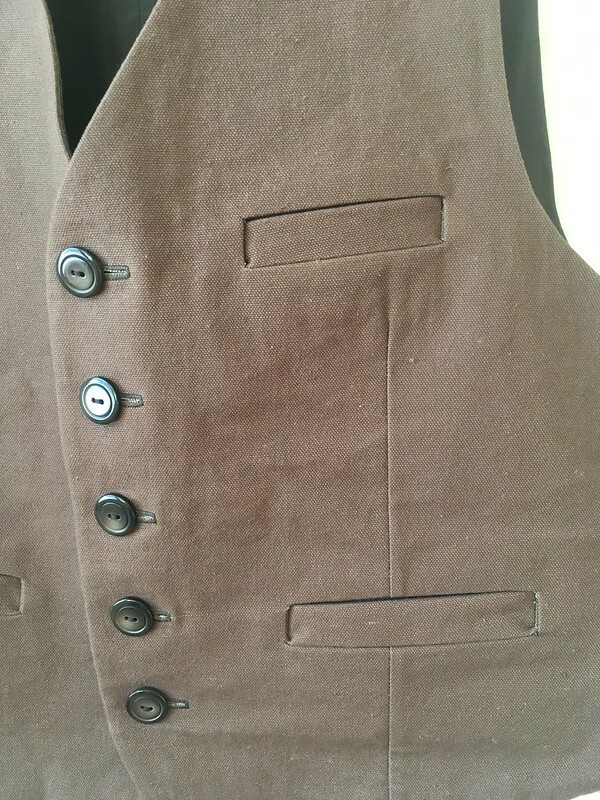 We decided to leave the last (non-functioning) buttonhole off the bottom of the waistcoat. 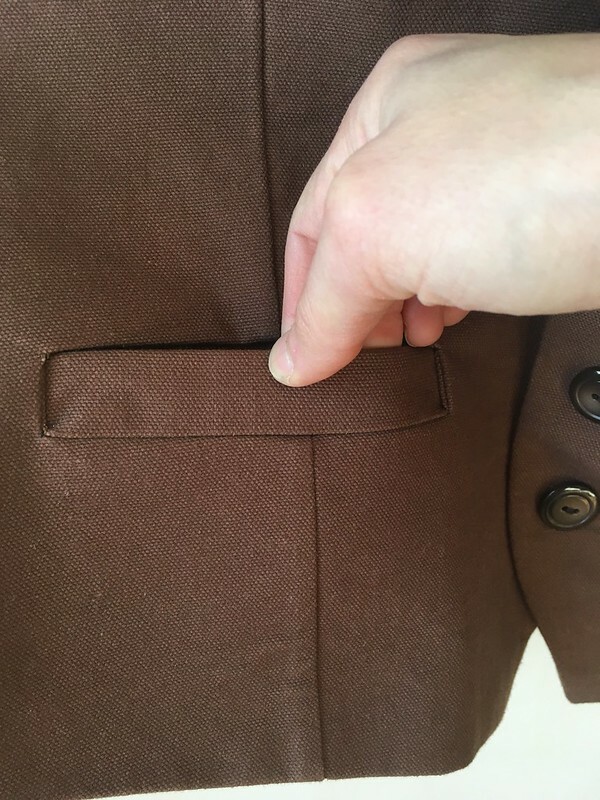 It was his preference to only have functional buttonholes, and since this is for him, I wanted to make it just how he wanted it. I’m so happy to report that he loves it and it looks terrific on him! When it was finished, and I saw it on him, I really felt it was something I could be proud of. That’s a great feeling. While I did get him to agree to let me snap a few pictures of him wearing it, I know it’s not his favorite thing to do, and I’m anxious to blog this project before I forget the details. If I end up getting a good picture of him wearing it, I’ll update the post. At some point, I hope to make him another version with the modifications we noted for next time using higher quality materials. 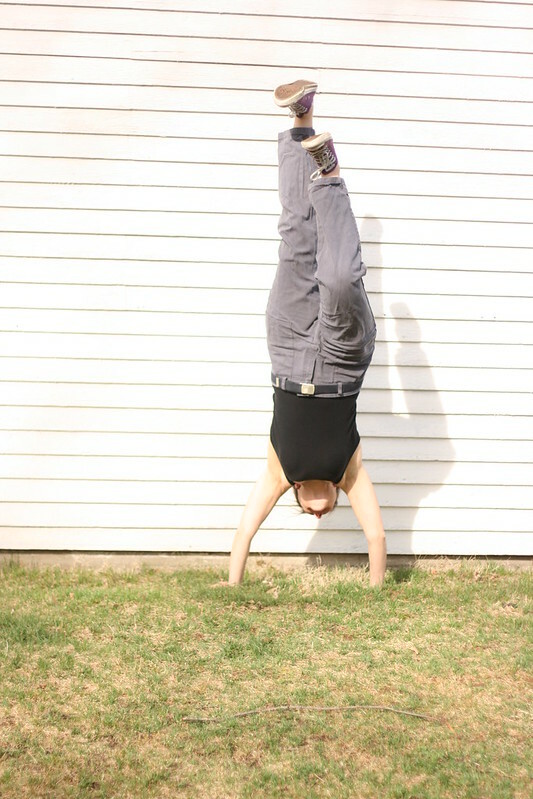 When I was growing up, I was a tomboy. 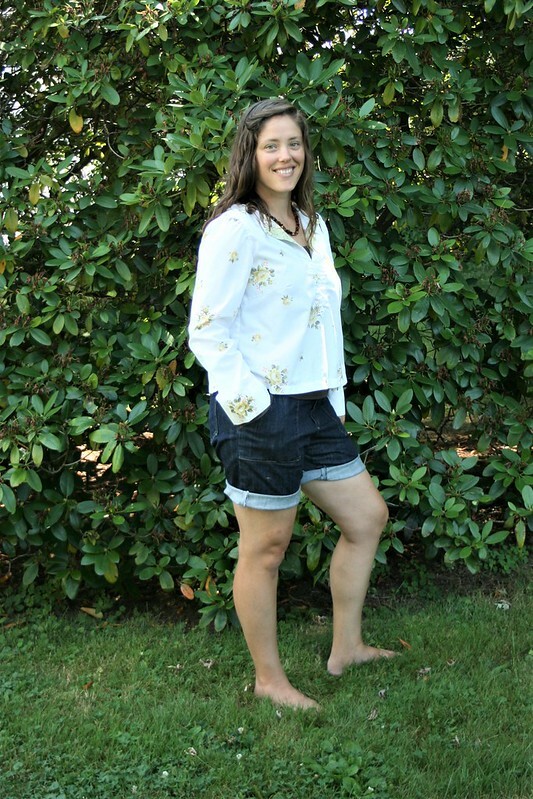 I’ve grown more “girlie” as I’ve gotten older, but there is still a side of me that loves the practical and strong in clothing. 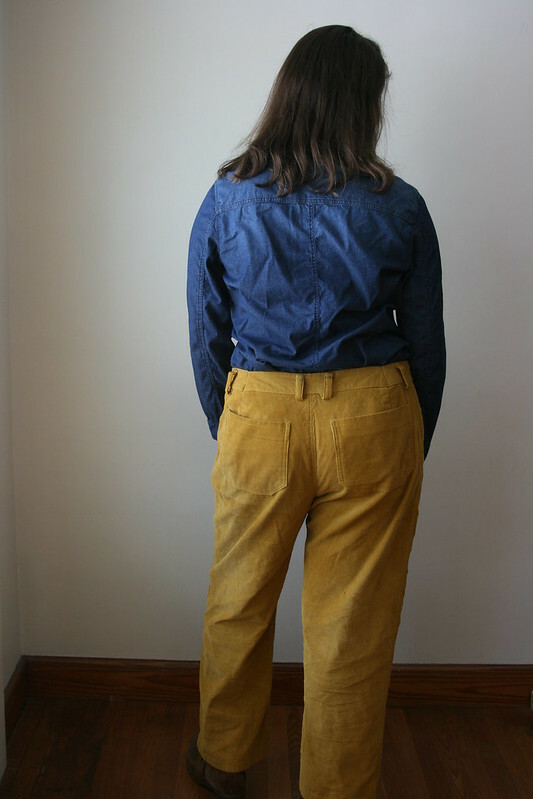 I love a good dress, but I also get a lot of inspiration from workwear. 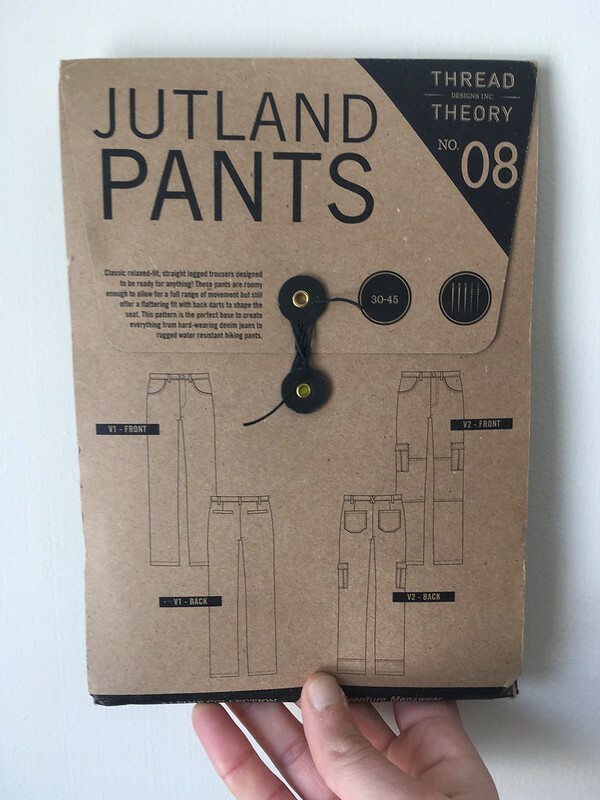 That was why, when I realized that the Thread Theory Jutland Pants that I made for my husband (here and here) fit me as well, I started planning my own pair. 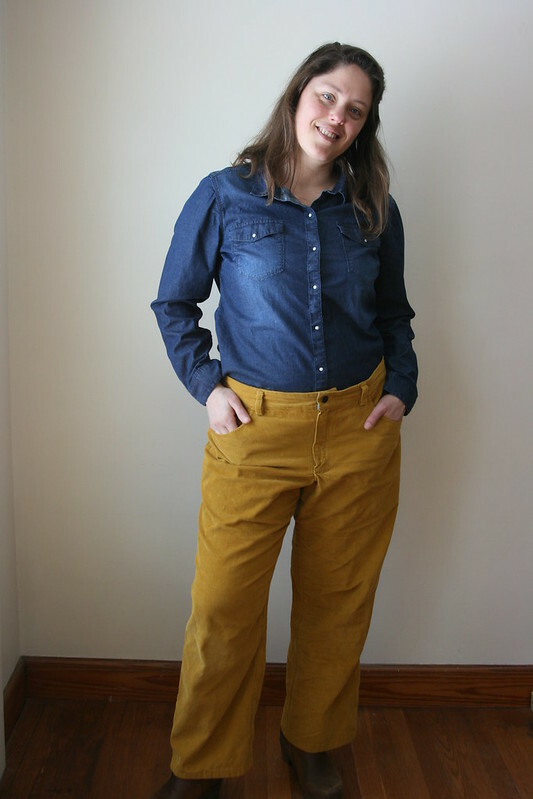 I’ve always loved straight- and wide-leg pants, but after several years of closer-fitting styles being the norm, it’s a big change to go back. 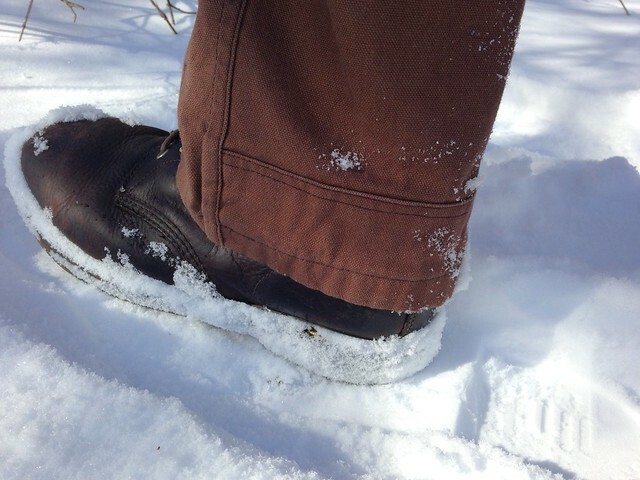 I wasn’t completely sure about my idea…until I borrowed one of the pairs I had made my husband so I could test out the fit. So. Comfortable. I was sold. 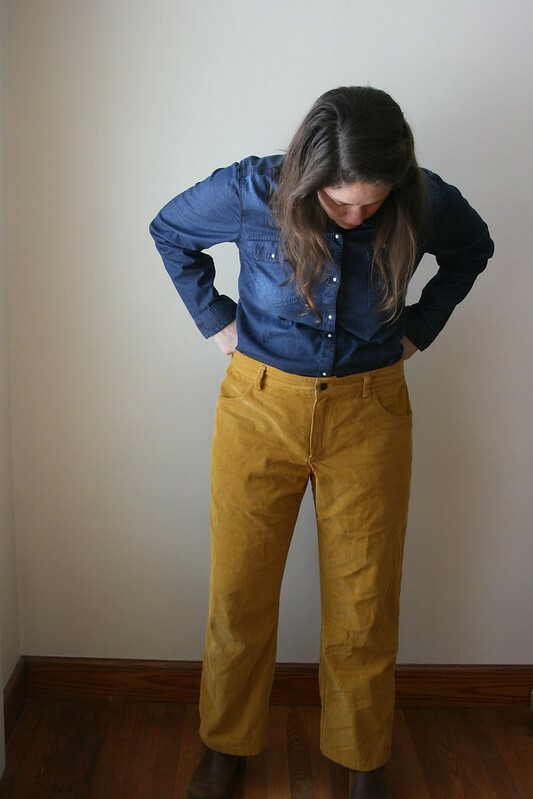 The pattern and fabric for these pants came from Pintuck & Purl. 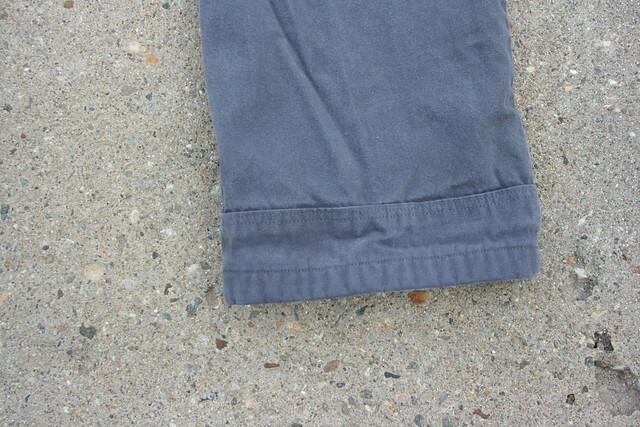 The fabric is a 100% cotton grey English canvas (which I obviously should have pressed before taking these pictures–oops!). 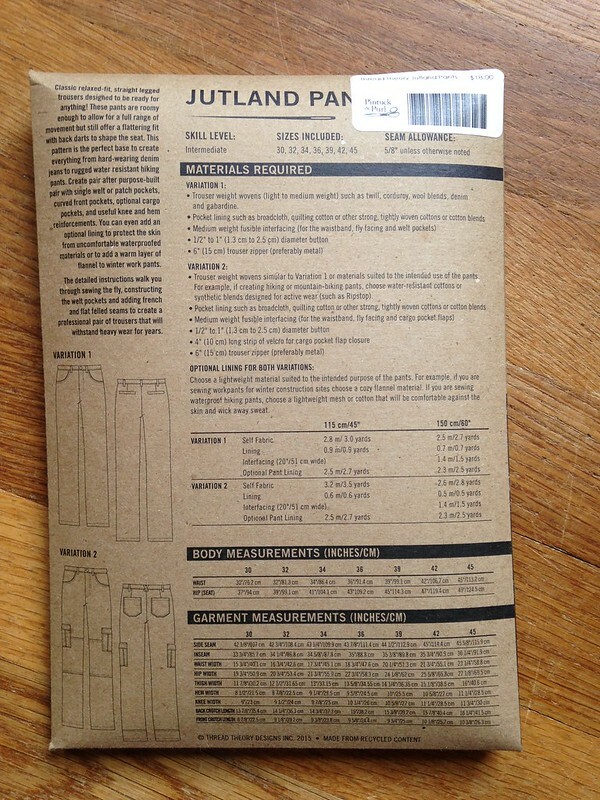 This is the same fabric I used for my husband’s second pair of Jutlands, but in a different color. The pants came together really quickly since this is the third time I’ve sewn them, I didn’t bother with special topstitching thread, and since I forgot to flat-fell my outseams (oops again). 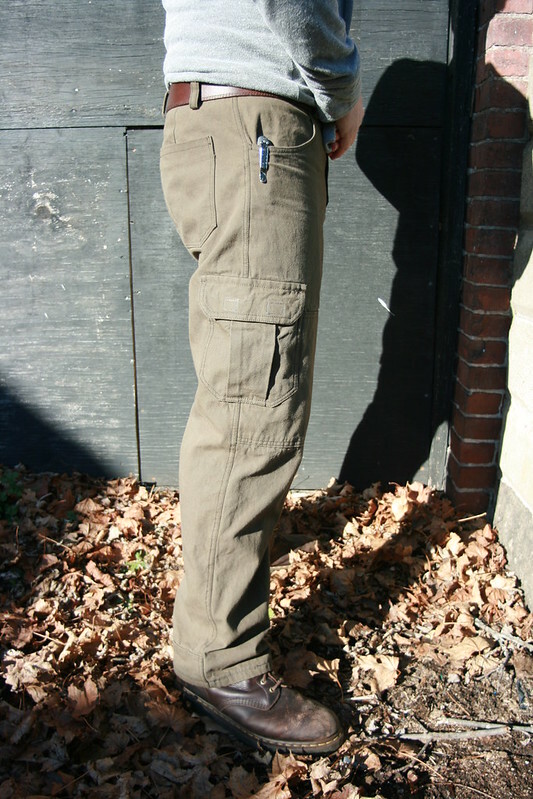 I also left off the cargo pockets and knee patches, retaining only the hem reinforcements. 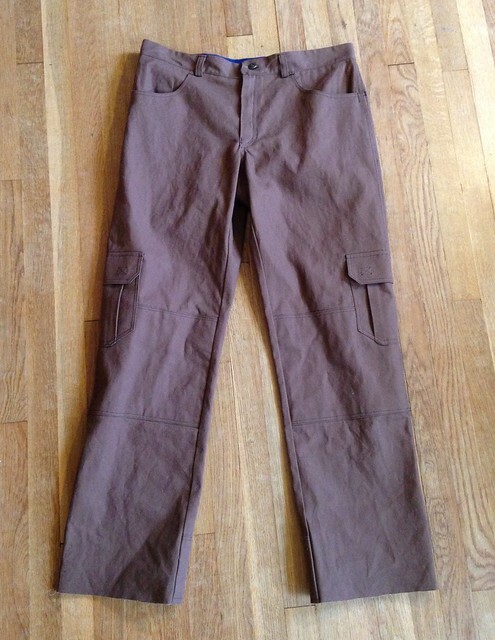 In fact, in a triumph that I will probably never experience again, I sewed these pants in a single day. Yes. One day. I was proud of myself. 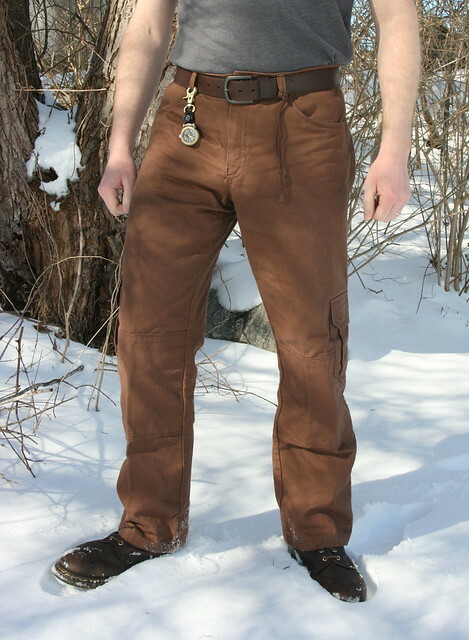 These pants are rugged and neutral, and will coordinate with a lot of other colors. 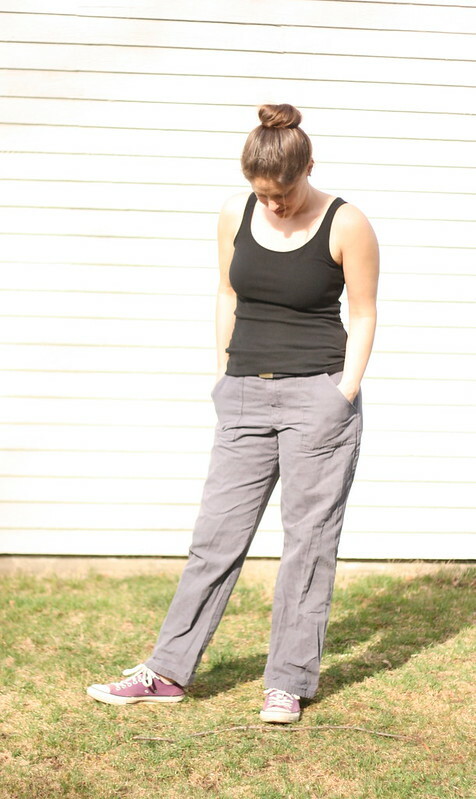 I made these with the goal or having something workwear inspired, but also of having actual work pants. 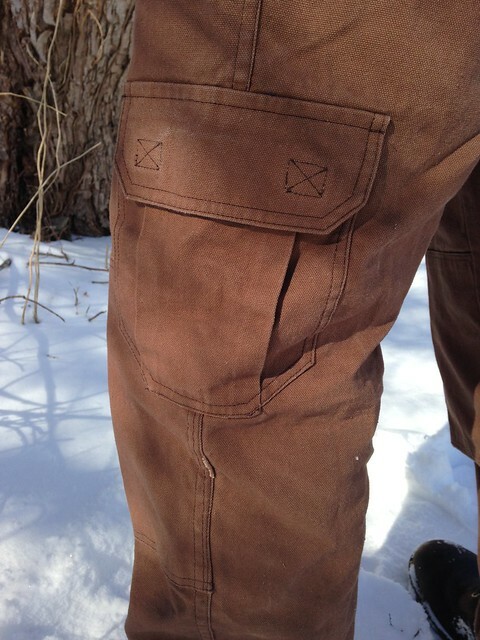 In fact, it took me so long to get pictures of these, that I had already done some outdoor work while wearing them and, much to my annoyance, stained them. I guess they’re legit now, right? It’s almost time for Me-Made-May 2017! Are you joining in? 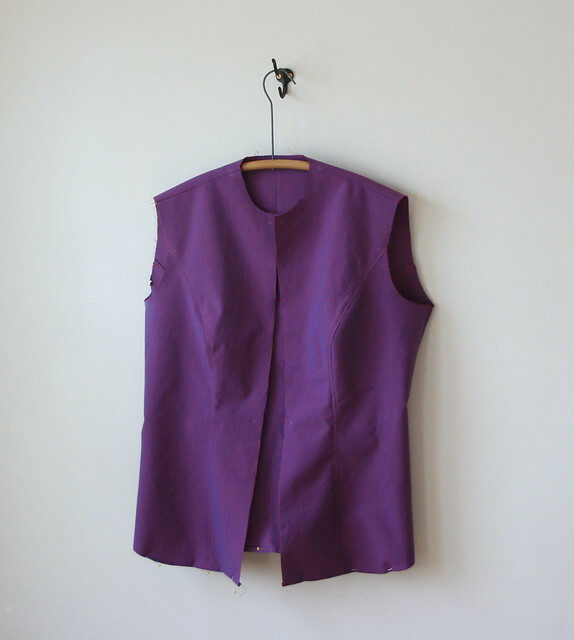 If you’ve never heard of Me-Made-May, it’s a challenge to help you wear and love your handmade garments. You set your own goal at whatever level is challenging for you. Here’s my pledge: ‘I, Lisa of patternandbranch.wordpress.com and @lisa.poblenz sign up as a participant of Me-Made-May ’17. I endeavour to wear both a top and bottom (or dress) that I have made each day for the duration of May 2017’. I hope I can do it! And I hope you join in, too! I’ve been having a lot of fun looking up fashion details on Pinterest. 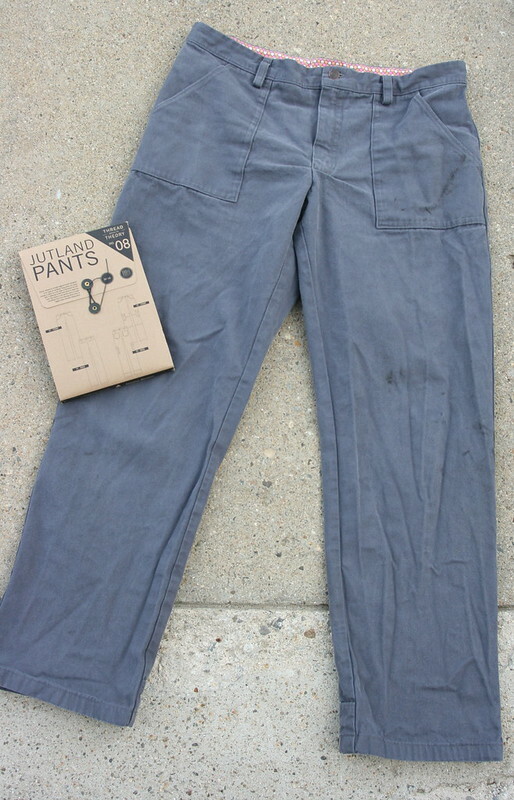 Searching for “pockets” or just “fashion details” has unearthed a lot of inspiration. You can see my Fashion: Details board here. 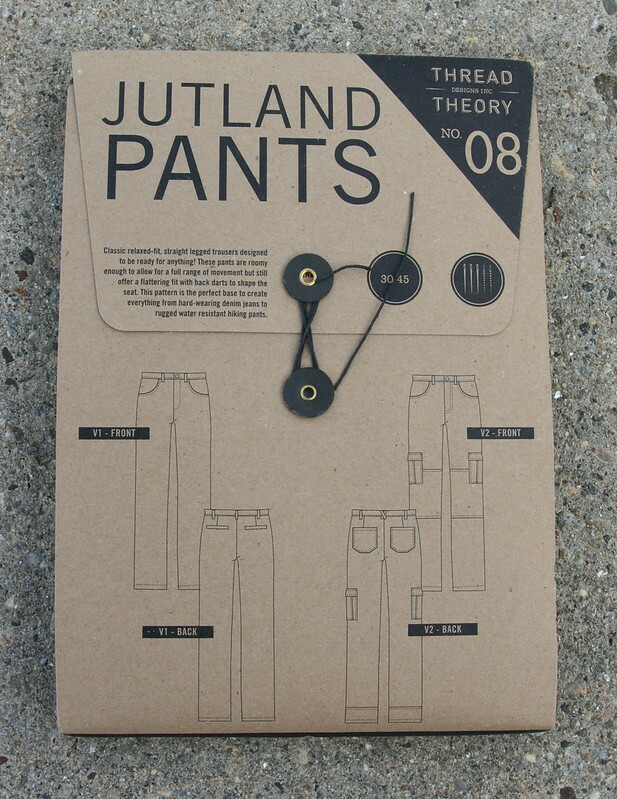 Have you ever admired the complexity or ingenuity in a piece of clothing in a store? I certainly do when I look at workwear and outdoor clothing. There’s so much thought that goes into each piece, not to mention interesting design lines and cool fabric. 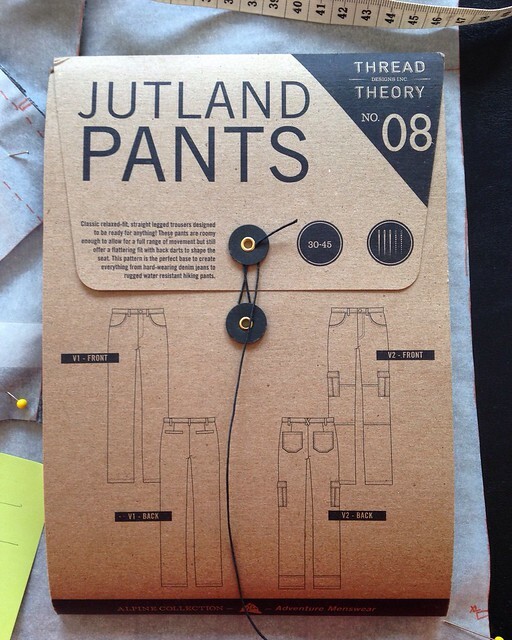 That always seemed like a fairly unachievable level of sewing, until the first time I made the Thread Theory Jutland Pants. After sewing my first pair (Variation 2) toward the beginning of this year, I began planning another in better fabric. I knew it would be awhile before I started, but I wanted to make these again. 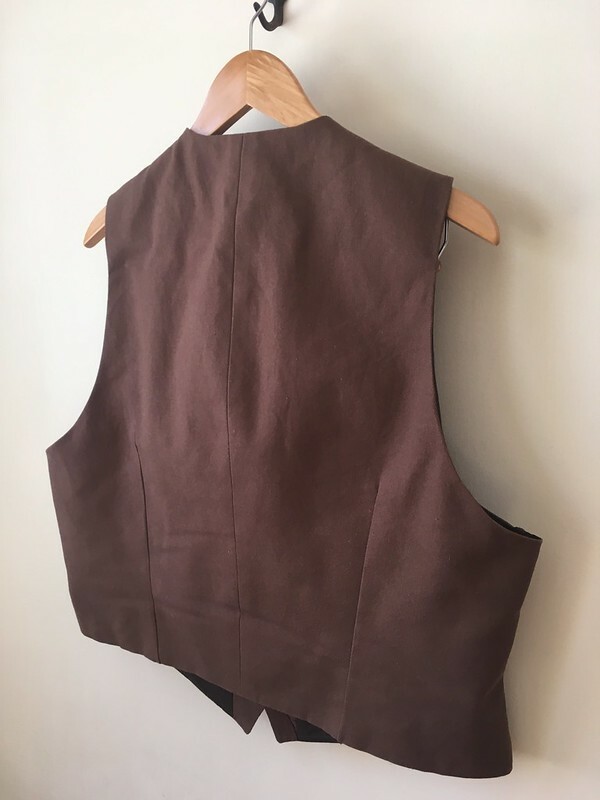 In July, I found just the right fabric at Pintuck & Purl in Exeter, NH, a cotton brown/green English canvas that was a lovely 61″ wide. It was heavy, but nice. Once my husband approved the color, I bought the fabric, but still wasn’t ready to cut into it. And then, like so many projects that get left in the dust when we chase after the new, it became a “someday” project. 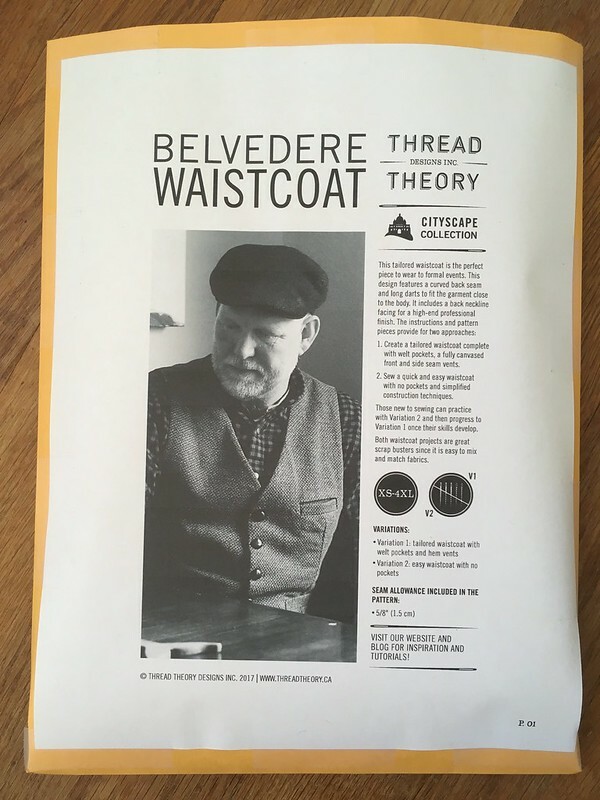 The fabric sat in my stash all summer until one day, as I was reading Thread Theory’s blog, I saw that Pattern Review was running a Menswear contest with a tempting prize–a gift card to Thread Theory’s online shop. This was it. 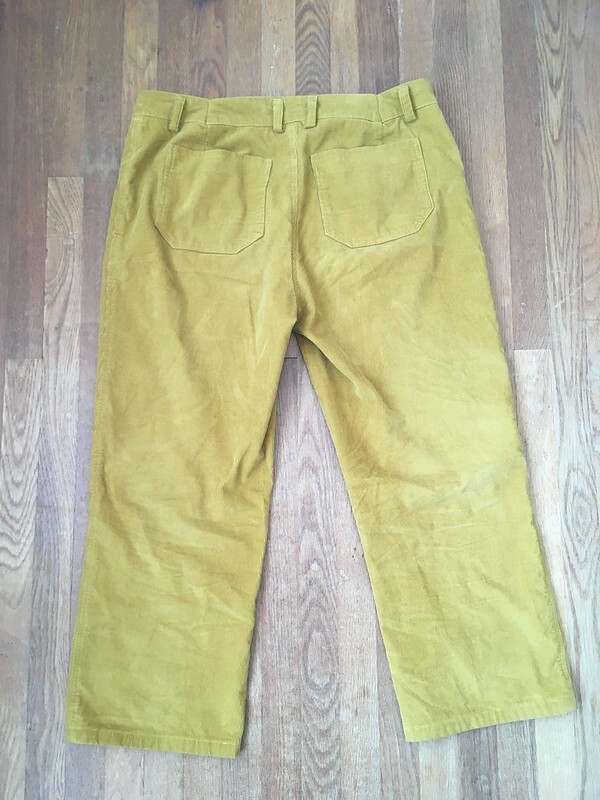 It was time to make the pants. Having made that first version, I had a pretty good idea of what tweaks I needed to make on this version, and there were only a few. 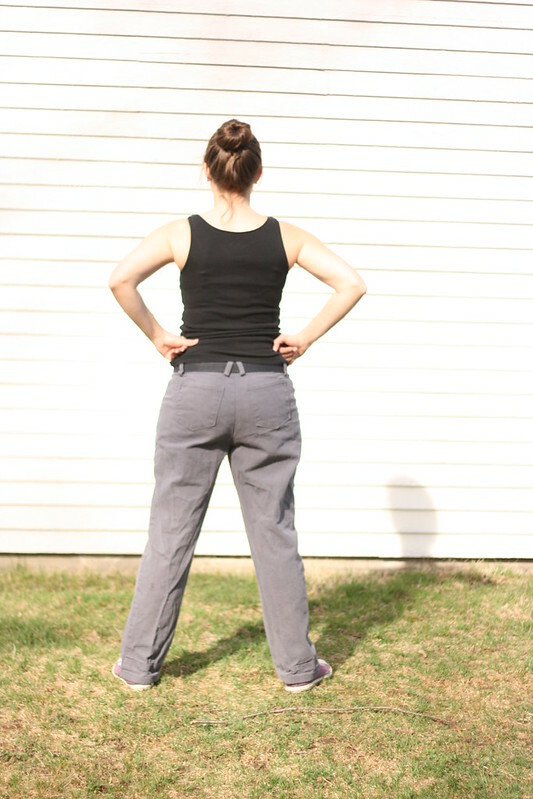 He asked me to raise the side cargo pockets, raise the knee patches, and lengthen the belt loops–all doable. 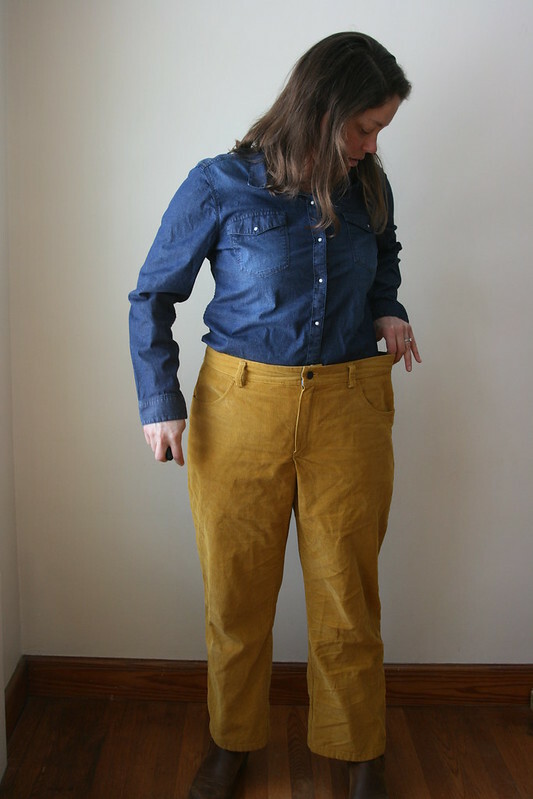 In addition to the three yards of the canvas that I bought, I used 1.25 yards of Cotton + Steel’s cotton lawn solid in Fedora for the waistband facing, pockets, and the insides of the top of the cargo pocket flaps. 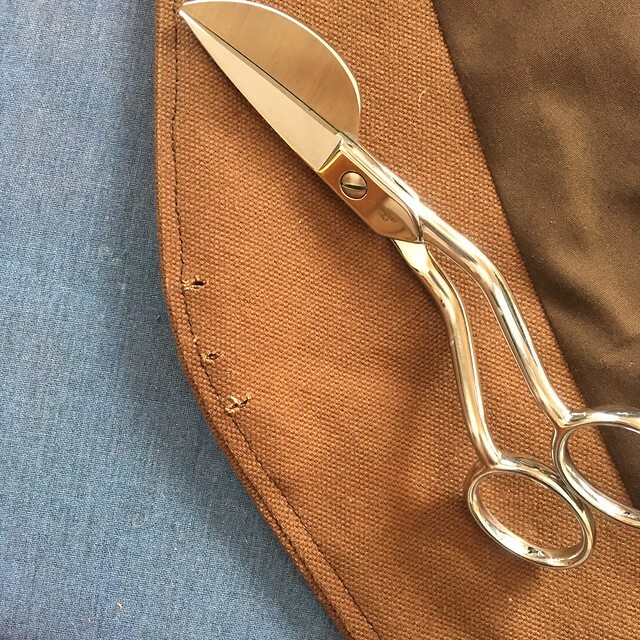 Other than that, there was some midweight interfacing, bias binding, Gutterman polyester thread for construction and Gutterman topstitching thread. 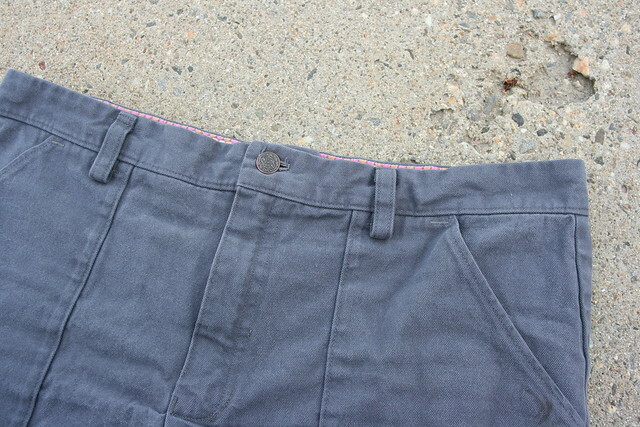 I used a jeans button for the front, a jeans zipper, and Velcro that was sticky on the back for the cargo pockets. As far as materials go, I loved the canvas. That turned out to be a great choice. It’s heavy and nice, but not so heavy my machine couldn’t handle it (although I have ordered a “Hump Jumper” since making these in order to prevent skipped stitches when going over multiple layers of fabric for the next time I make something like this). 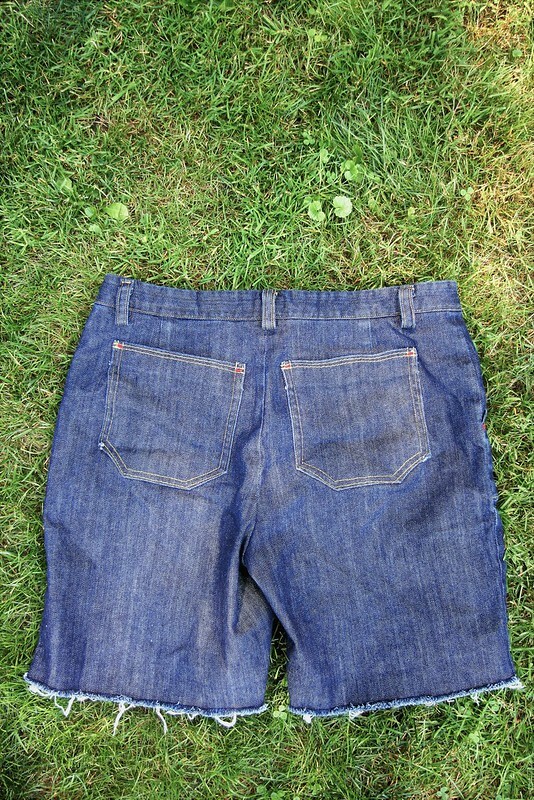 The lawn feels great, but was too light for the waistband facing, I think. Before fully trimming my zipper, I managed to create a hole in the facing where the zipper teeth rubbed on it. 😦 I’ll try a quilting cotton next time, at least for the waistband facing (but honestly, I’ll probably use a quilting cotton for all those little bits). 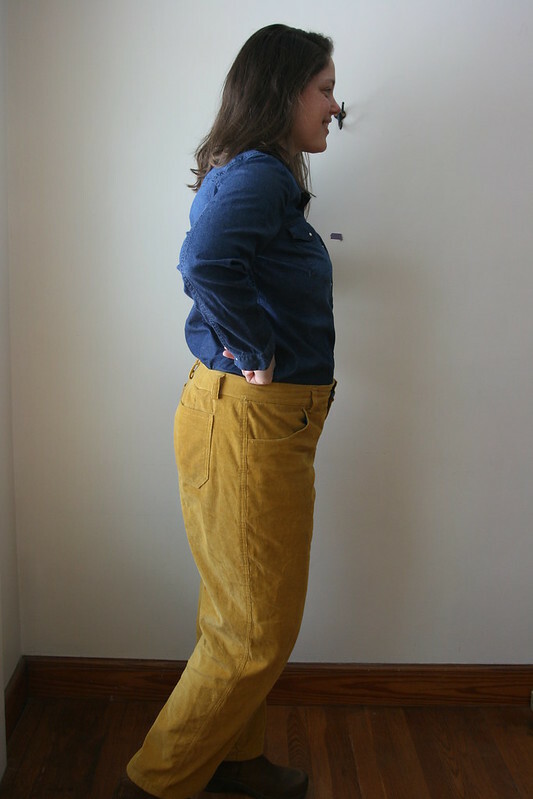 The interfacing, jeans button, bias tape, and zipper were fine, as was the construction thread, which I really like. I’m done with Gutterman topstitching thread, however. 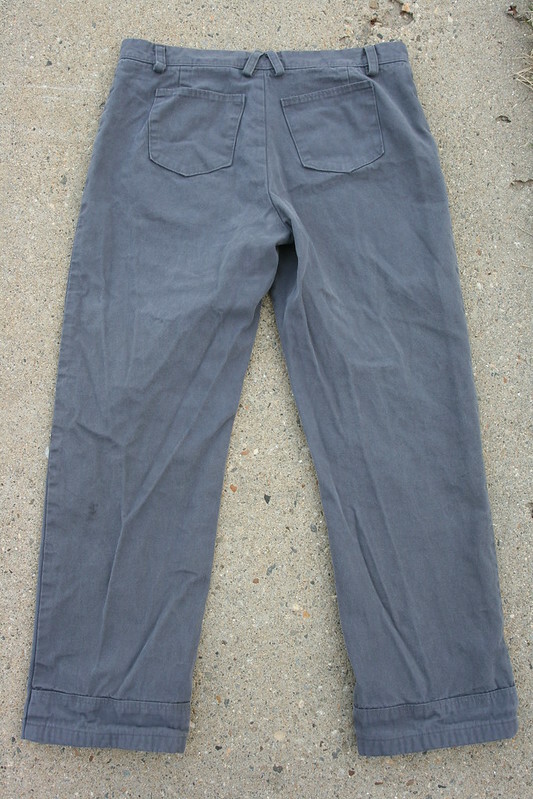 After making two pairs of pants with it (these and my olive green pair), I just don’t like it. 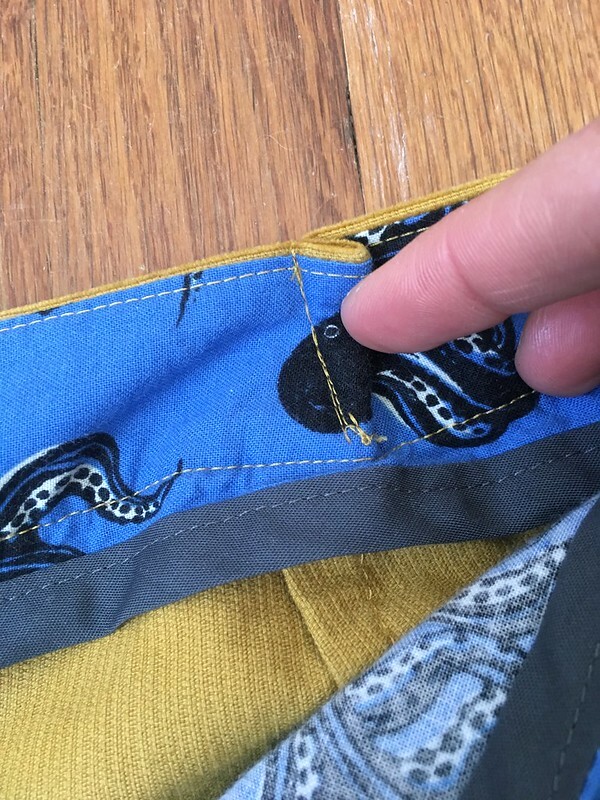 I get a lot of “thread nests” on the underside of my garments, despite using a jeans needle and making sure my tension and presser foot pressure were appropriate. Maggie at Pintuck & Purl has given me a few other kinds of topstitching thread to try out (a rainbow one and Coats brand), so we’ll see how those go on future projects. The jeans needle I used was a good choice, and the only time I had trouble with it was when I applied my Velcro. I think it was because the back of the Velcro was sticky, and it gummed up my needle. There were a lot of skipped stitches there, so I think I’ll try some without the adhesive next time. Live and learn, right? As far as the contest goes, voting runs from the 18th-24th. 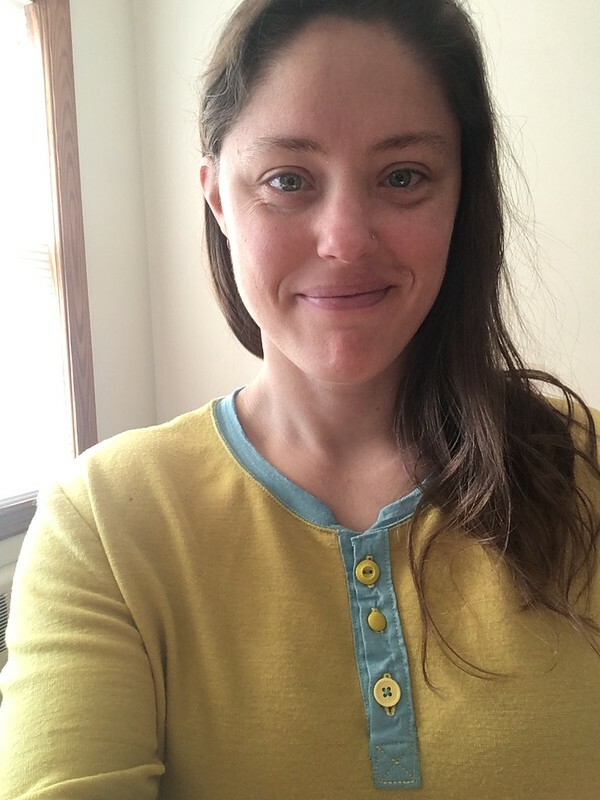 If you’ve been a Pattern Review member for at least 90 days, you can vote, and I’d love your vote if you think my project deserves it. You can vote in the contest here. You can also read my review of the pattern if you want more/different information than I’ve got here. Fingers crossed! Update: Thanks for your votes, everyone! I didn’t win the contest, but I had the second highest number of votes. 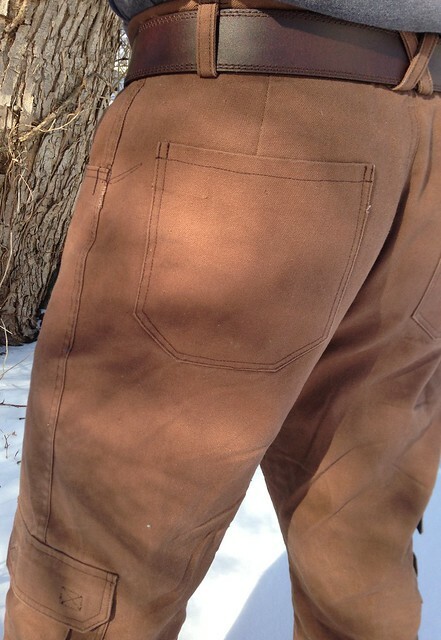 So, no gift card for me, although my husband definitely won since he finally got his pants! Congratulations to the winner, who made an amazing blazer for her husband. 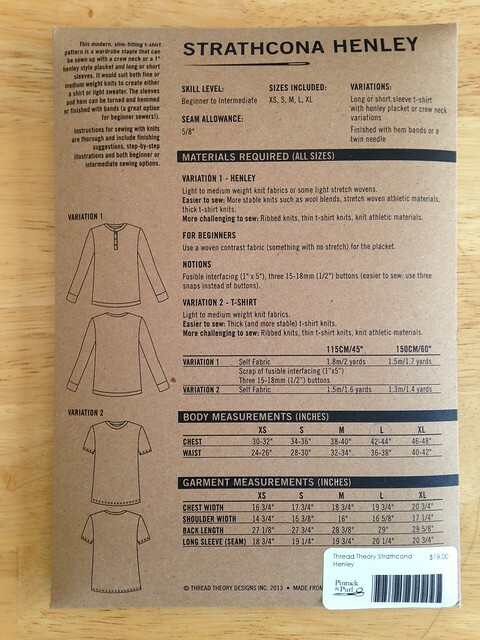 The WAWAK Sewing catalogue! I saw on Instagram that @peterlappin had ordered one, so I got one myself and, I have to say, it’s pretty awesome. I even placed my first order for the previously mentioned “Hump Jumper” (Isn’t that the weirdest name? 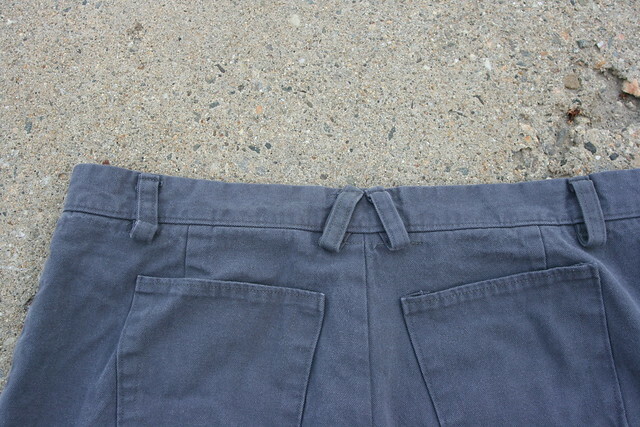 ), jeans buttons, and Zipper Ease for stuck zippers. They have some cool stuff at great prices. 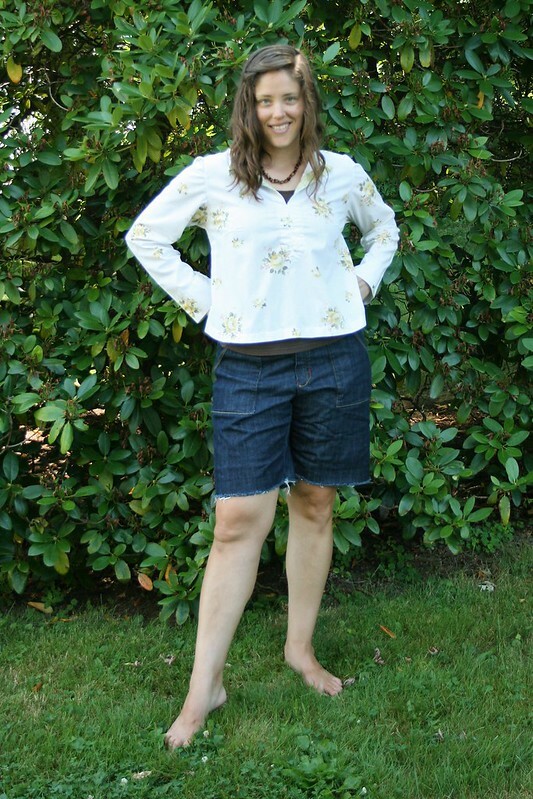 I really like sewing round-ups where bloggers highlight new patterns and cool sewing projects on the web. 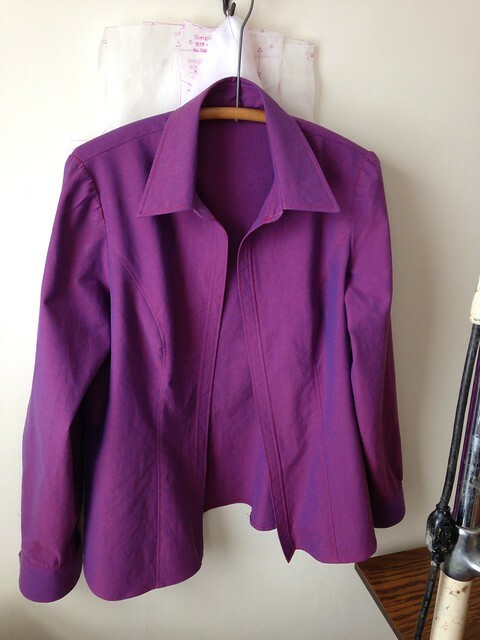 My two current favorites are from Closet Case Files and Helen’s Closet. If you have other favorites, I’d love to hear about them in the comments! Simplicity 1538. This has really become my favorite button up shirt pattern, as evidenced by my first try from a vintage sheet, tiger shirt, and flannel shirt. It’s similar to the Grainline Archer in style. On Wednesday I cut out my fourth version of this shirt. I love it. Droste Dutch process cocoa powder. I had some left from a few recipes, so I made hot chocolate with it (plus sugar, milk, salt, and heavy cream), and it was AMAZING. 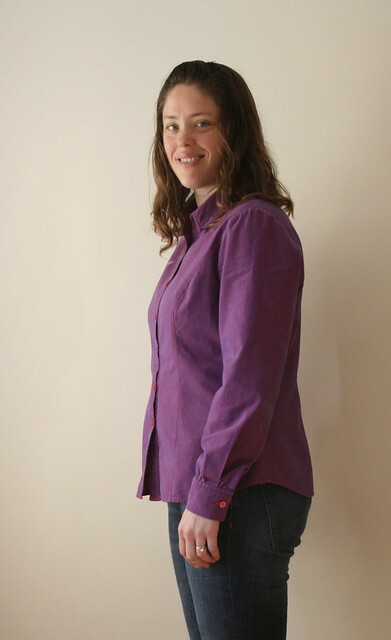 It is a lovely, lovely thing to sew from a pattern you have made before and made positive fitting changes to. 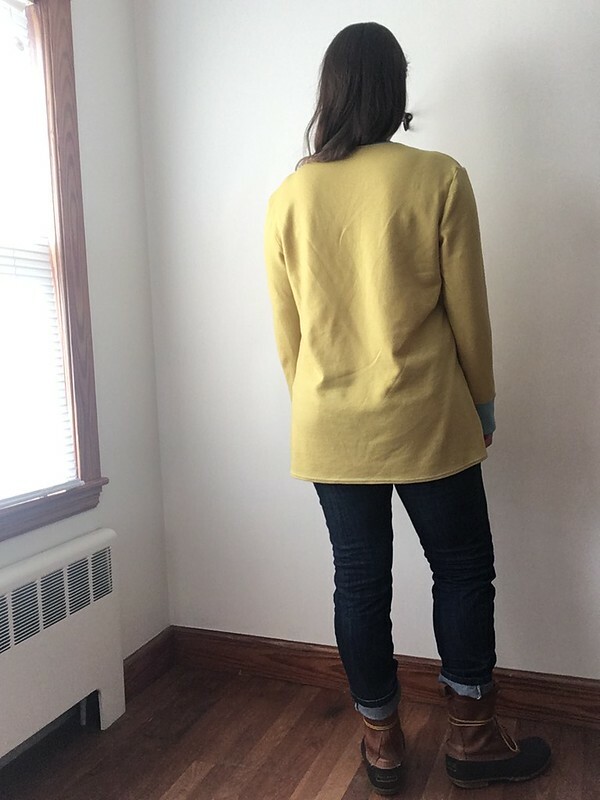 I’m just learning how to fit things to my own body, and I used this pattern (Butterick 5526) for one of my first attempts, making a broad-back adjustment to it before trying a first draft. In making this second shirt, I didn’t change anything. 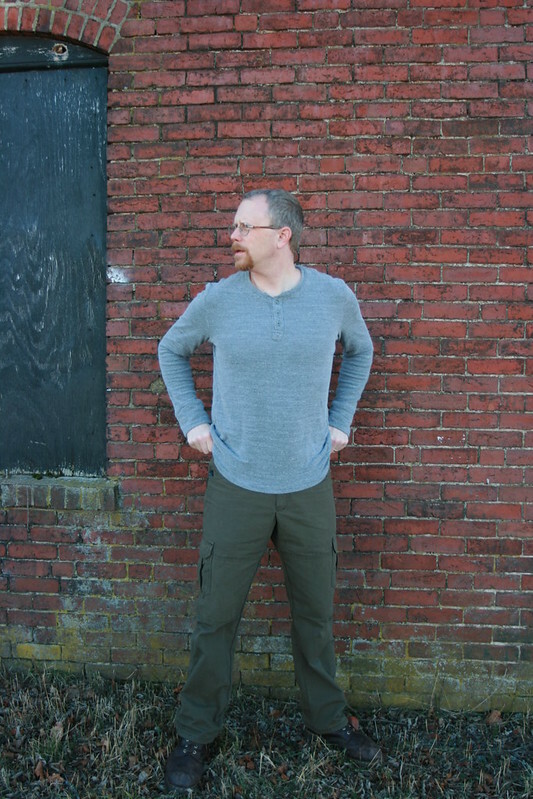 Someday, someday, I will try a swayback adjustment, but since I can wear the shirt comfortably without it (and the fabric pools in my back, where I don’t normally see it), it just doesn’t feel as urgent. The real feature of this edition of the shirt is this cool fabric. I got is last summer at Field’s Fabric in Kalamazoo, MI. If I remember correctly it’s from Robert Kaufman fabrics, and is a cotton. Here’s the cool part: it’s not actually purple. It’s a trick on your eye. 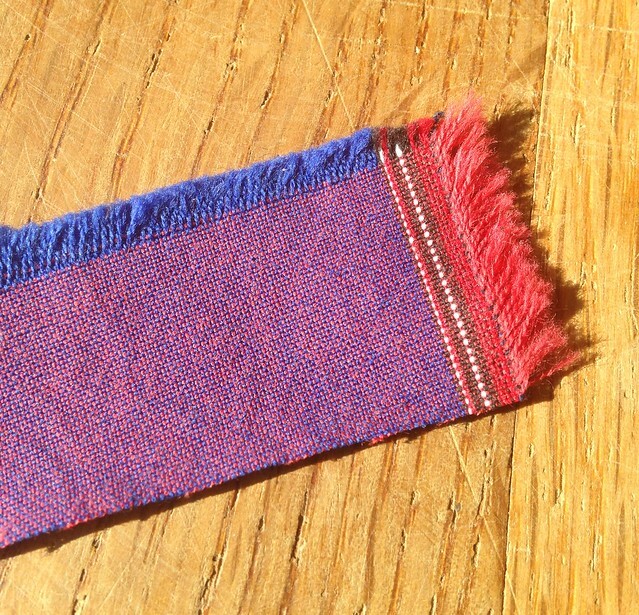 The fabric is made of red threads woven perpendicularly to blue threads, and your eye sees it as purple. Color theory in action! (For an interesting read on color, page through Josef Albers’ book entitled Interaction of Color. Mind blowing!) The weave also gives the fabric a fascinating effect (I want to say “iridescent”, but that’s not quite right) in the light. 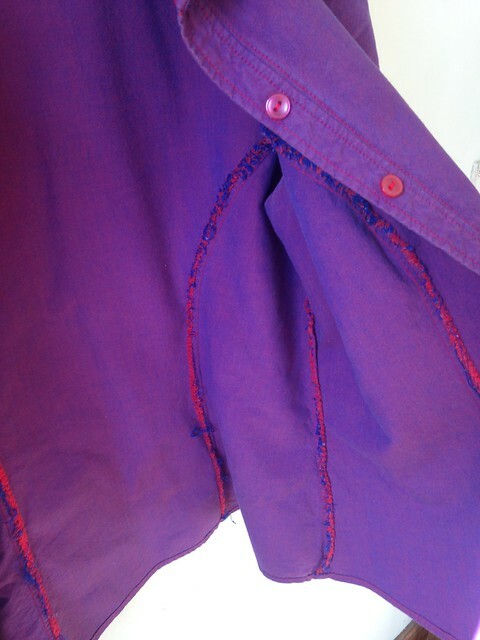 I chose to topstitch this shirt in red and used plain red buttons. I searched high and low for cool, unique buttons, but in the end, these seemed right. 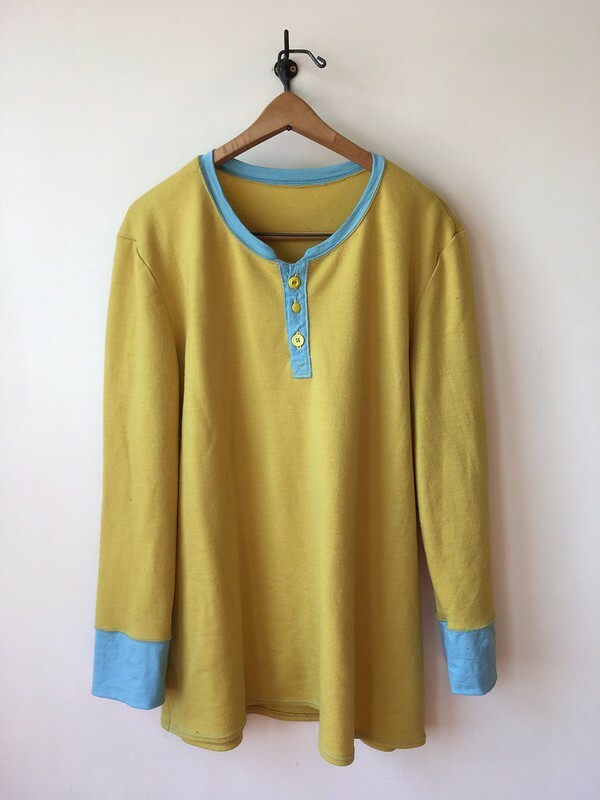 In future editions of this shirt, I’d like to use French seams inside, but I was sort of afraid they wouldn’t make it around the curves and I would get lumps. 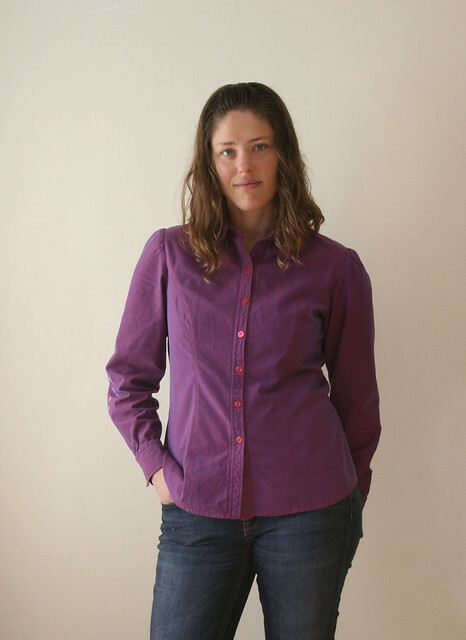 However, Lauren of the blog Lladybird is the one who I copied convinced me to try this pattern after I saw her many versions, and she uses French seams, so I should give it a try, too, perhaps. 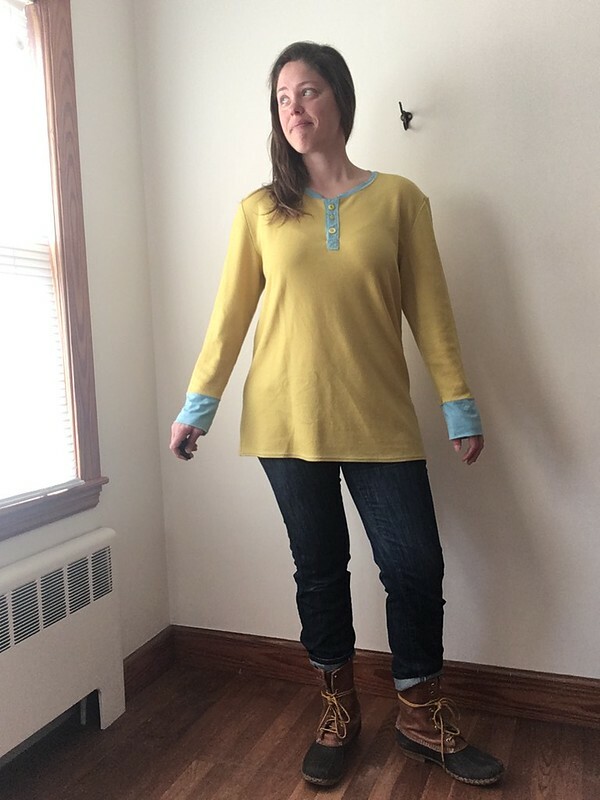 For now, let’s pretend the insides of my shirt, which I finished with a zigzag stitch and which consequently frayed in the wash, are a “design feature”. And lest you think I’m aiming for the “moody” look in these posts, I’ve been sick all week, and I was still recovering when I took these (and the next few posts’) shots, so it might show. I feel like I have to say this because when I take blog photos now, I always hear my Grandma’s voice in my head telling me to smile. I tried, Grandma! How about some “in progress” shots? I’ve had this shirt done for a while and it’s gotten lots of wear. The color is one I wear often, and the weight of the fabric is really, really nice. It’s more substantial than my gingham version (which is not high quality fabric, really), and it feels like it will hold up a lot longer, too. I love Robert Kaufman fabrics. Even if I’m wrong about this being from them, I still love Robert Kaufman fabrics. I hope you all have a good weekend. I’m already feeling better than I was yesterday when I took these photos, so that’s hopeful. Now how about some fun recommendations? Thanks to the Thread Theory blog for featuring the Strathcona Henley and Jutland Pants that I made for my husband along with some other amazing things created from their patterns. Check out all the great projects! The coats blew my mind, and I was definitely eyeing the shorts for ideas for the future. Also on the Thread Theory blog, several cool videos on how various sewing items are made. I really liked that the scissors they showed are still largely made by hand, and seeing how pins and needles are made was fascinating. This music video by OK Go is CRAZY (crazy awesome). They always have the best music videos. Do you think they did it in one take? 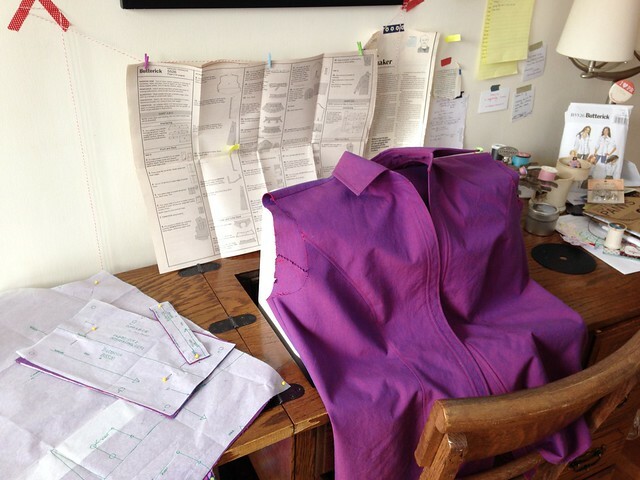 Is it still unselfish sewing when you get the knowledge, even if you don’t keep the garment? Of course it is! Finishing this project kept me on a serious sewing high for a good week. 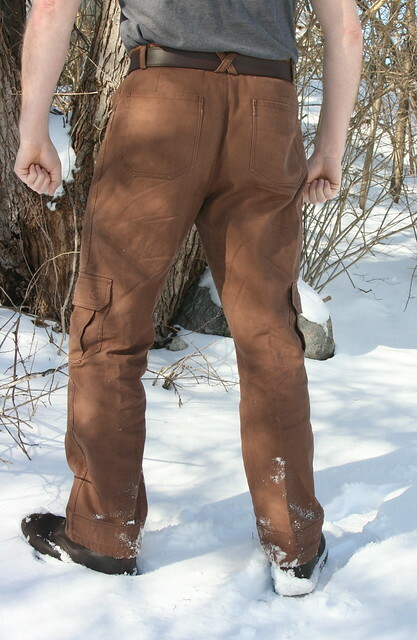 I made real, true pants! 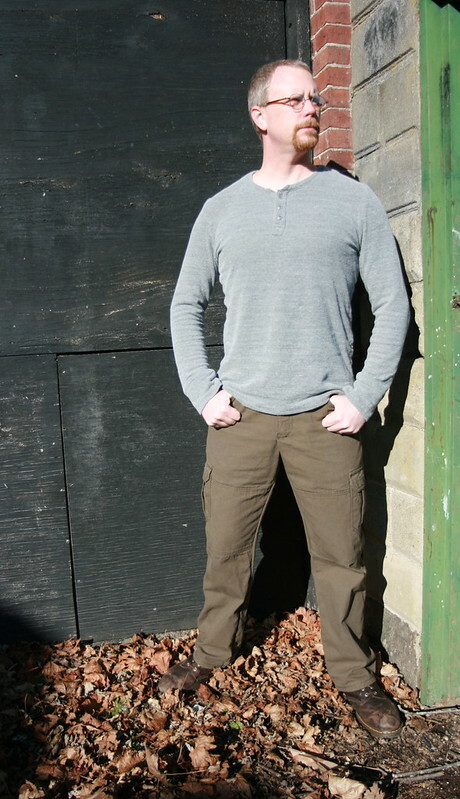 Let me introduce you to the Jutland Pants, Variation 2 (cargo pants) by Thread Theory Designs, Inc. I made these for my husband, and I think they are a success! I don’t measure success by perfection. 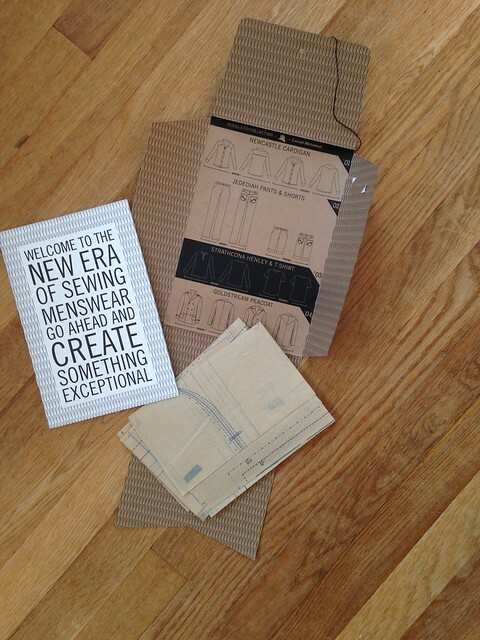 In this case, success meant finishing the project and producing a wearable garment that fit well enough to be worn. 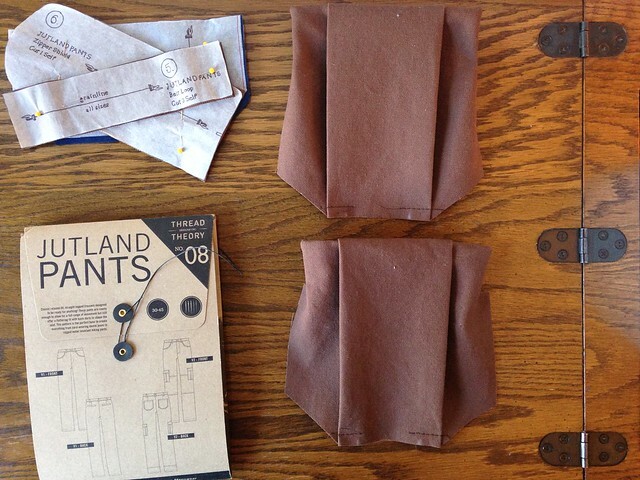 I’ve made leggings before, but I’ve never successfully made fitted pants. 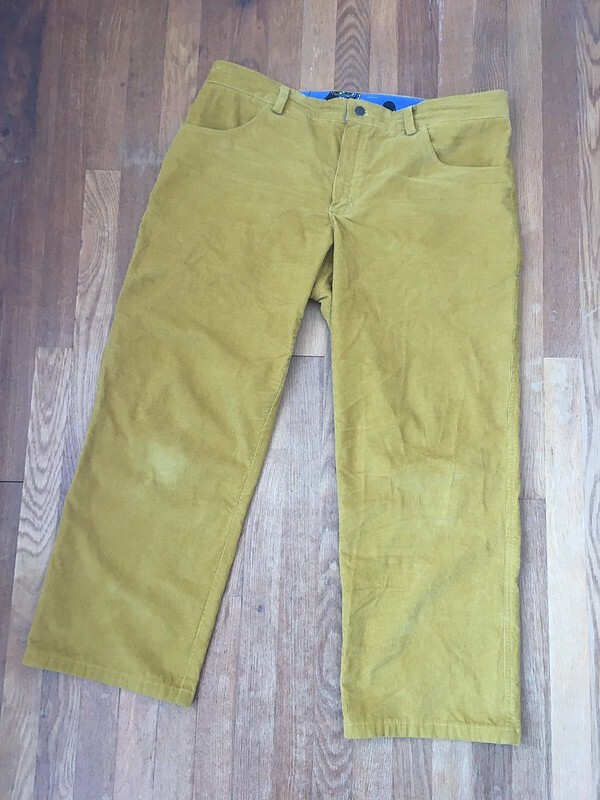 I dimly remember an unwearable pair that I attempted for myself before I really got into sewing and an unfortunate craft fail, but this is my first finished pair of fitted pants that…fit. So, let’s talk details. 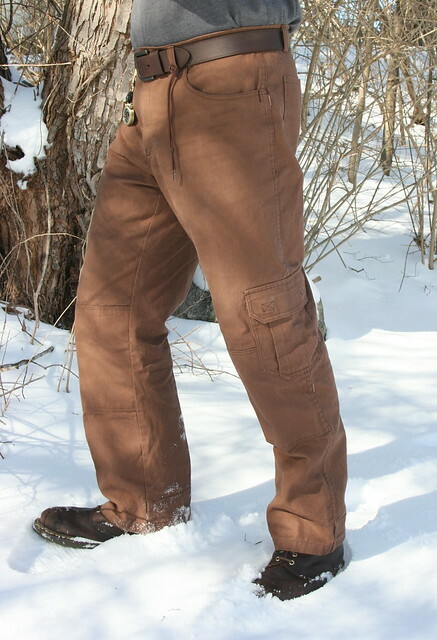 What I really wanted to create was an awesome pair of pants like these ones from Duluth Trading Company. 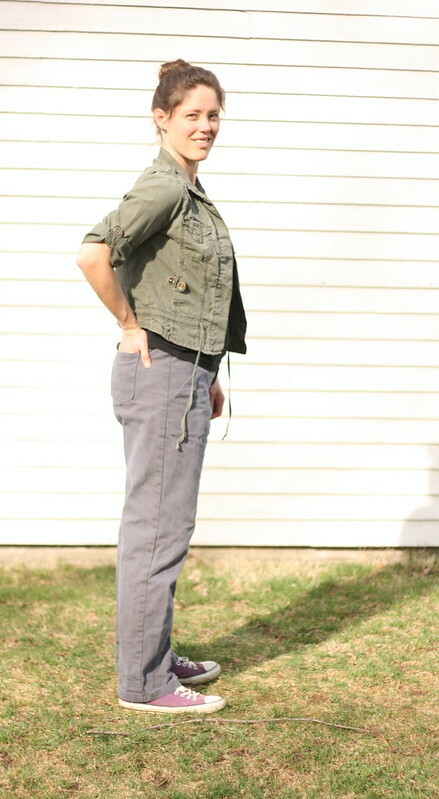 The inspiration pants have all sorts of special features and although I didn’t include all the possible options in this first home sewn pair (like lining, knee pads, or a crotch gusset), between the pattern and the Thread Theory website, you can learn how to put all these cool extras into your pants. When I saw this pattern at Pintuck & Purl in Exeter, NH, I knew it was one that I wanted. 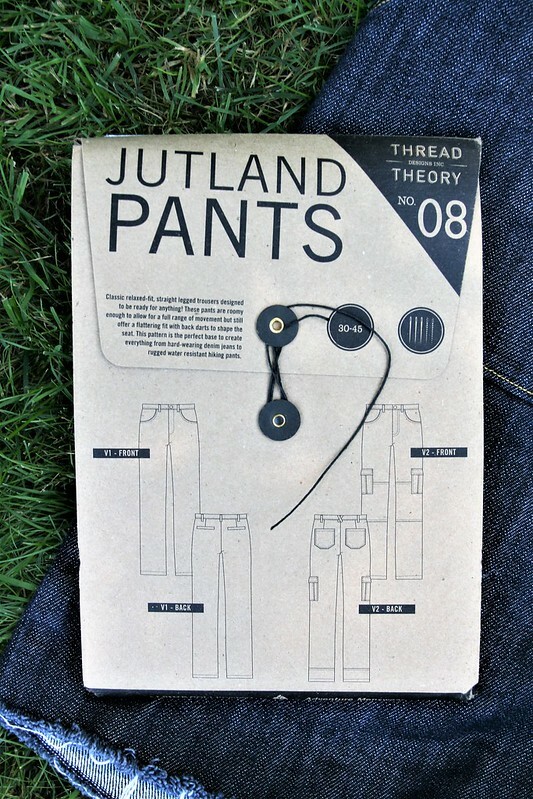 Thread Theory patterns are not cheap, but in making these pants, I felt that, more than any other independent pattern I have tried, this one offers great value for my money. This is something I couldn’t make up on my own, print for free off the internet, or easily find from another company. 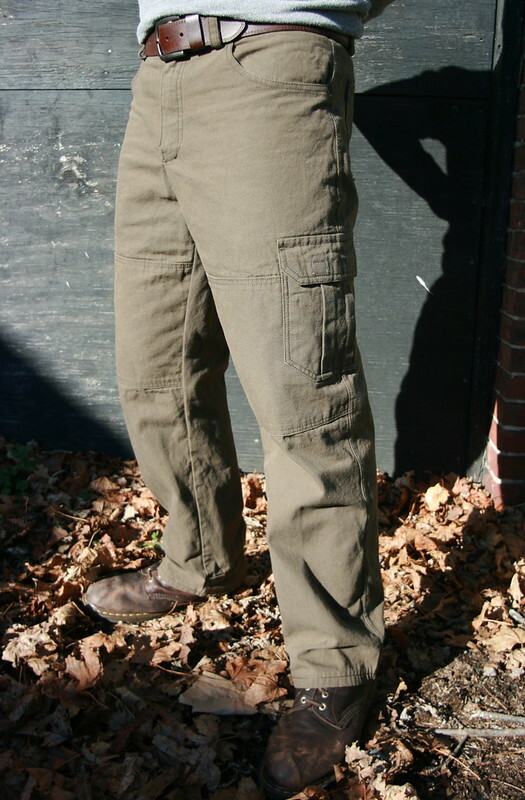 There probably are other cargo pant patterns out there and while I make many “Big 4” patterns, I was really glad to have the more individualized support that Thread Theory offers. They have a sew-along on their blog and in the two instances when I got tripped up and e-mailed Morgan (one of the owners), she got back to me and answered my questions. As far as all the fabric and notions went, I bought duck canvas on sale from Joann’s for my main fabric. My original plan had been to get some really nice canvas, but then I thought that I ought to start with something cheaper for my first try. The lady cutting my fabric looked really doubtful when I told her I was going to use it for pants. She told me it was the kind of canvas you used to make bags like you might get at L.L. Bean. It really shook my confidence, but I got the duck canvas anyway. In the end, it worked out great! Encouragement, people! That really would have been preferable! I also got a metal zipper that was as close as possible to the size called for, but a little longer because I couldn’t find the exact size. 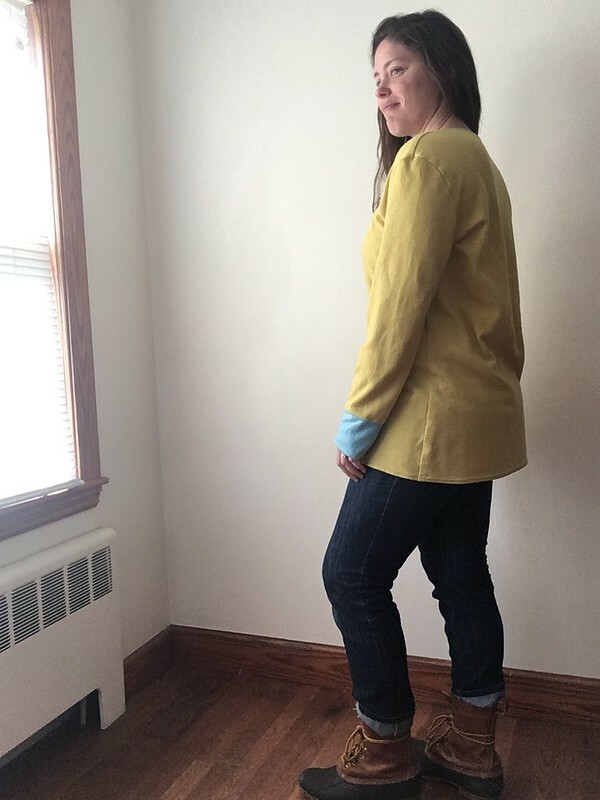 I bought medium weight fusible interfacing and a jeans button from Joann’s. 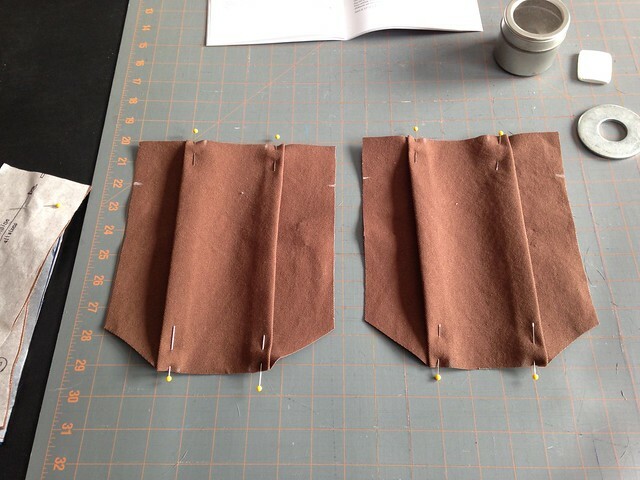 I had Velcro, bias tape, and something that I hoped was broadcloth or another suitable pocket material in my stash. I didn’t line the pants. Unlike nearly every sewing project I’ve ever done, I actually made a muslin for this one. I had an old sheet that came in handy for this. 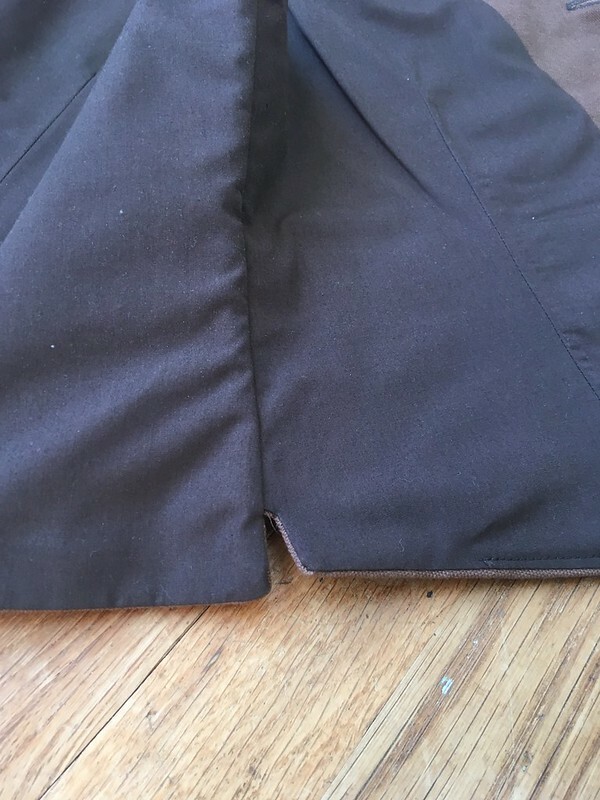 I took all my husband’s measurements and then made up a sample without the extras like the cargo pockets, knee patches, and hem reinforcements. The added benefit of the muslin, besides checking the sizing, was that I could practice a few areas like the fly and the main pockets. 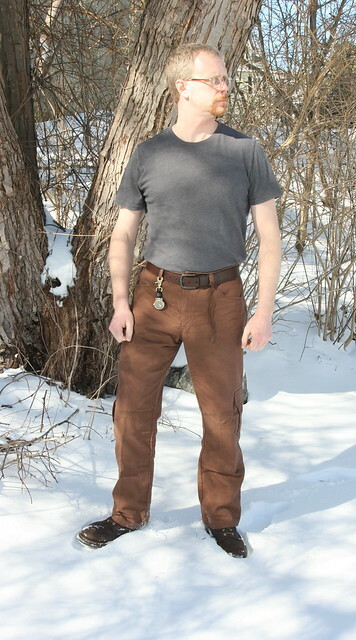 It turned out that the muslin was mostly right, but after evaluation, we shortened the pants by about an inch and made a straight size instead of grading between two sizes. This is definitely a complex pattern and I thought more than once that I was glad I hadn’t been the one who had to design it and then figure out how to communicate the directions for sewing it. You can tell that a lot of work went into creating this pattern. There were times when I wasn’t exactly sure what I was doing, so I had to turn the questioning part of my brain off and just follow the directions. Luckily, they didn’t lead me wrong. 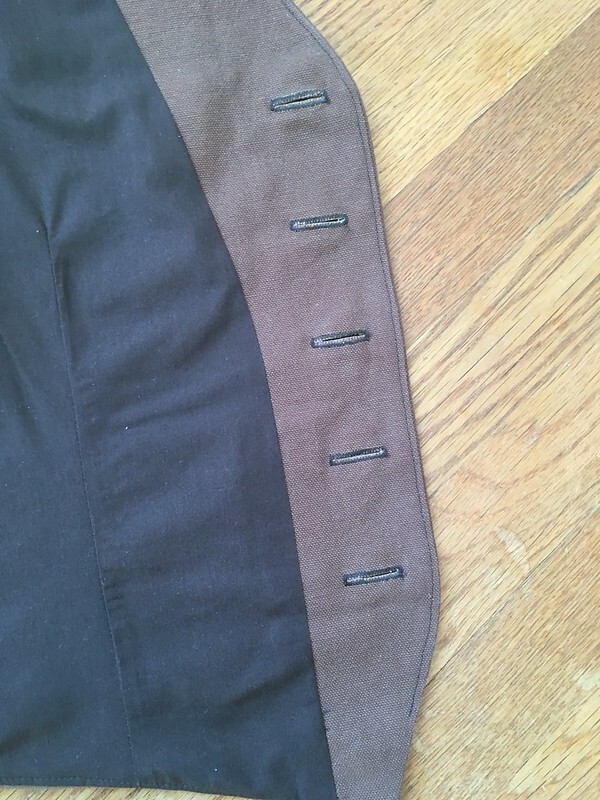 The two questions I wrote to Morgan about had to do with how to shorten a metal zipper (Could I really just use the waistband as the top stop rather than trying to remove teeth with pliers? Yes, thank goodness!) 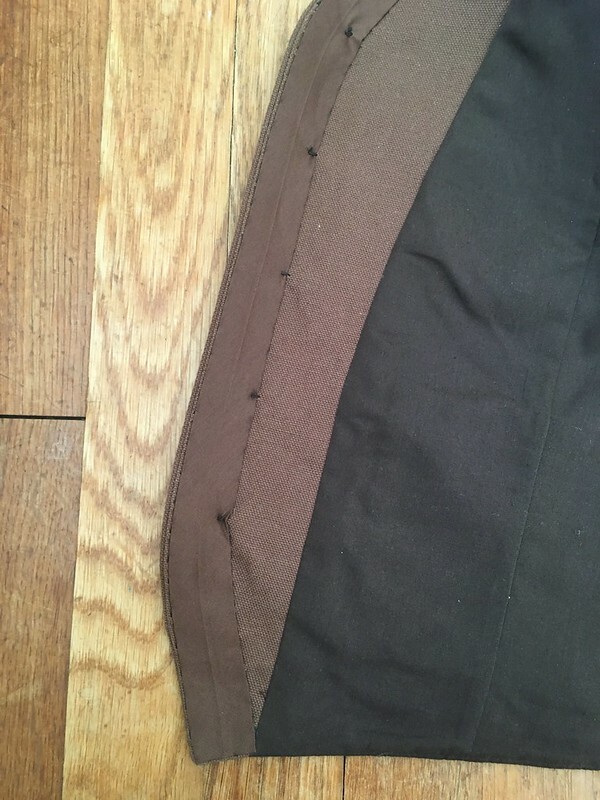 and if I was supposed to do a second line of stitching on the seat seam as pictured (You can, but you don’t have to and it complicates things if you are doing a lining.). 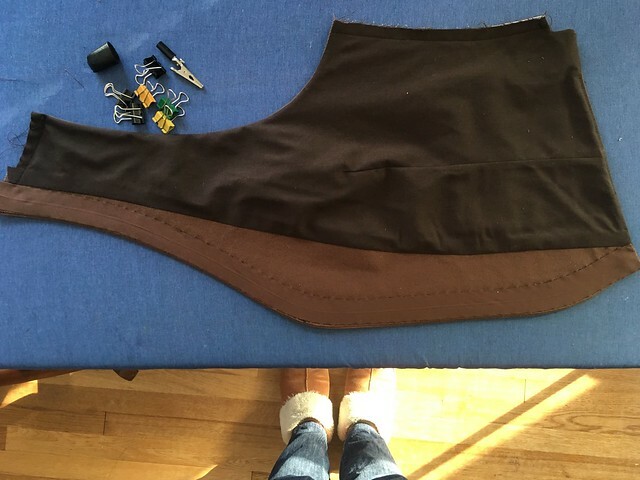 For the zipper, she recommended leaving at least one metal tooth above the seamline and letting the zipper tape extend into the seam allowance by about a centimeter. At that point, you can cut off the excess. I hand-cranked my machine when I went over the teeth just to be safe and avoid breaking needles. This was a billion times easier than trying to take out teeth with pliers! 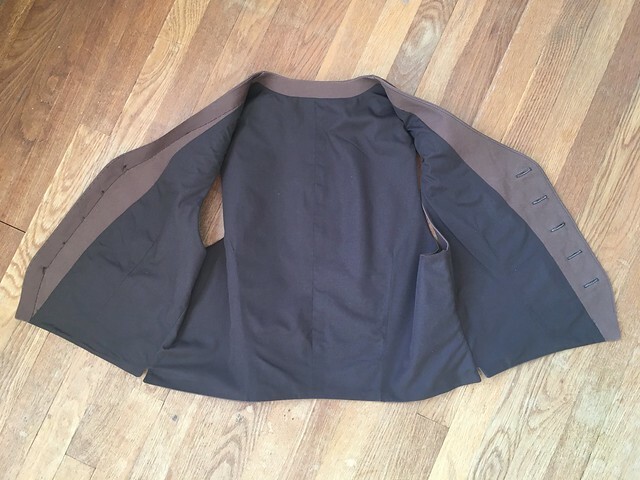 Concerning the second question, here is what Morgan said (I hope it’s ok to quote her–it will be more accurate and less confusing than if I paraphrase): “I didn’t end up including this in the instructions due to how it might complicate things when sewing the lining. 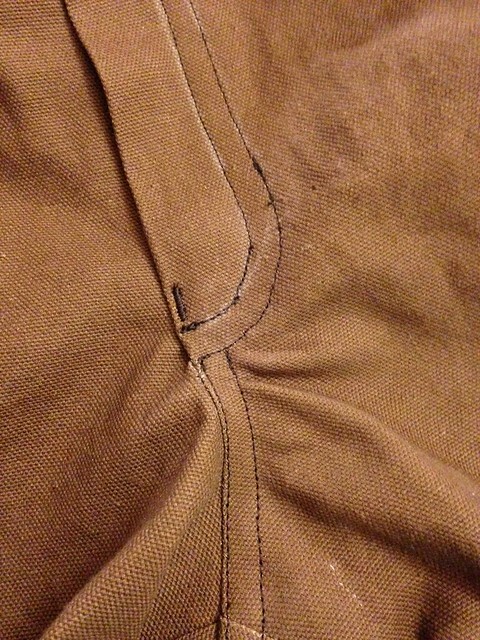 I usually stitch the seat seam by clipping the seam allowance at the base of the fly just as you describe. 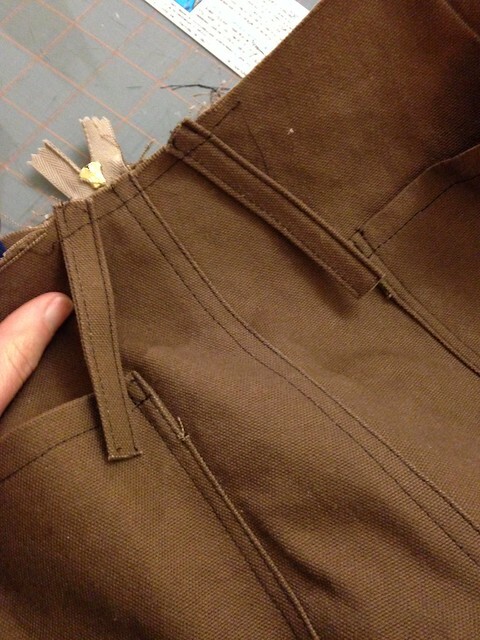 I stitch rather than pressing the seat seam so that the seam allowances stay to one side. 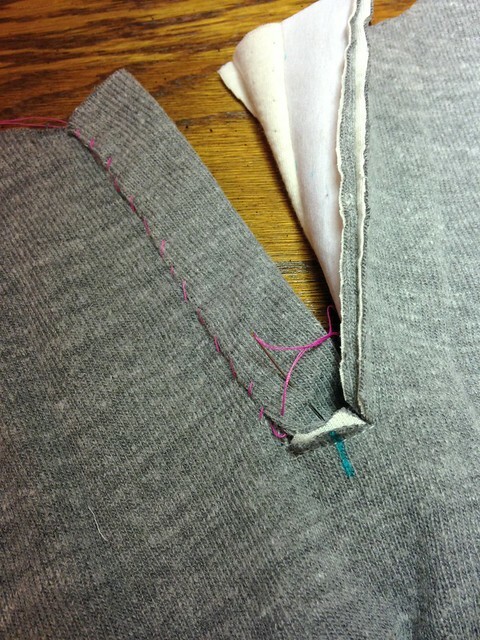 Depending on the fabric I am using, the seam just under the fly can look a little bit ‘warbled’. If this is the case, I clip one seam allowance a couple of inches below the fly so that they can sit pressed open rather than both pressed to one side.” I did the extra line of stitching before she was able to get back to me (because I was impatient) and while it was mostly ok, it did turn out a little funny, like she mentioned. After being worn a few times, though, it’s not noticeable any more. When I finished, the most amazing thing happened. I was proud. I was so excited. But mostly…I was grateful. I’m grateful that I get to sew. I know it’s a privilege that I have the time to improve my skills in something besides cooking for my family (let’s just leave housework out of this). We may not have a ton of extra money (we don’t), but we have been blessed enough that we have been able to make it, somehow, even though I have been home, and thanks to God’s blessing and the public school system that my kids are able to attend, I can do this. 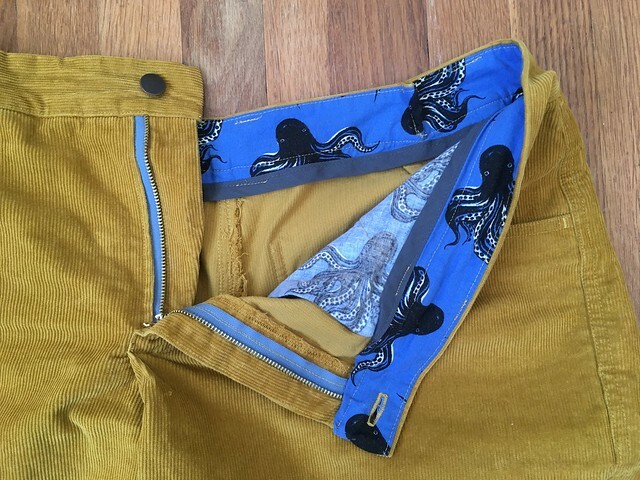 I don’t get all the housework done and, alternately, I don’t get to sew all day every day, but for this time in my life, I have been able to sew enough and have had the support and friendships to enable me to get my skills up to the point that I made my husband a complicated pair of pants. 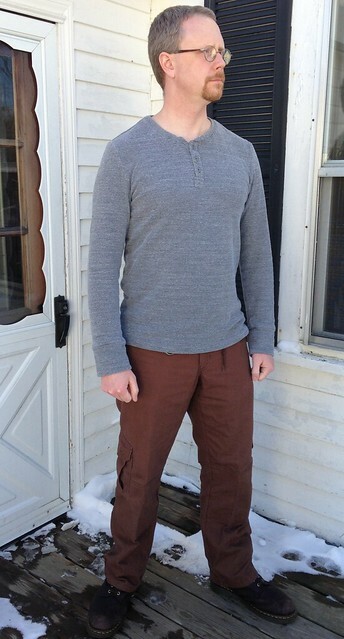 Maybe I won’t be able to sew forever or even want to, but for now, I’m really, really grateful to God, my family and friends, and now to Thread Theory that I made a pair of pants that my husband likes and wears. I made his shirt and pants! I’m so proud. 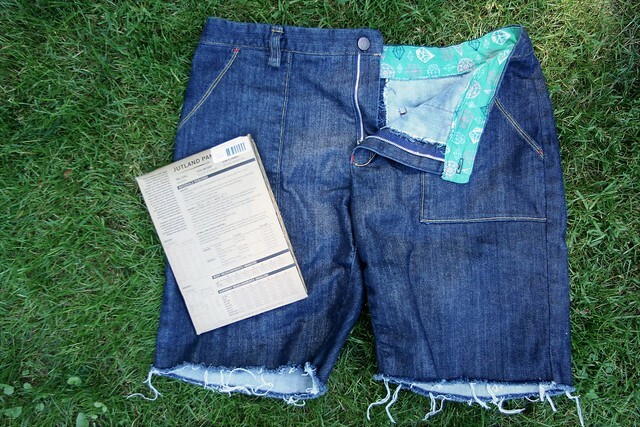 Now to get over my fear of making myself pants…and to conquer bathing suits…and sew all the things!!!! And don’t you think these need a clever leather tag on the back? I’m taking suggestions for what it should say! Leave yours in the comments! Just when you think you’re an INDIVIDUAL something like these awesome, AWESOME biker-style jeans comes along…and you just want to copy them. 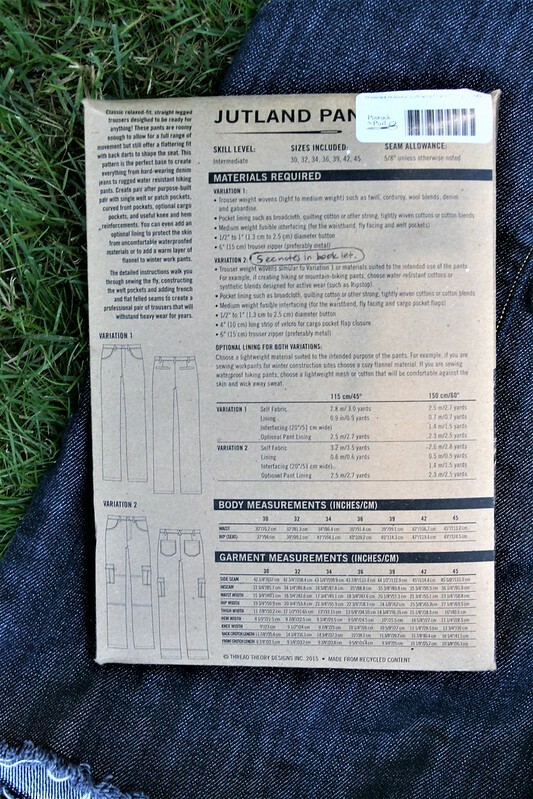 I want these jeans. Double Chocolate Banana Bread (recipe from Smitten Kitchen). I was skeptical, but it’s so good! If it’s from Smitten Kitchen, that will probably always be the case. More Christopher Walken. More Jimmy Fallon. More Will Farrell. More Cowbell! UNSELFISH SEWING??!!! Yes, Aliens Have Taken Over my Body. 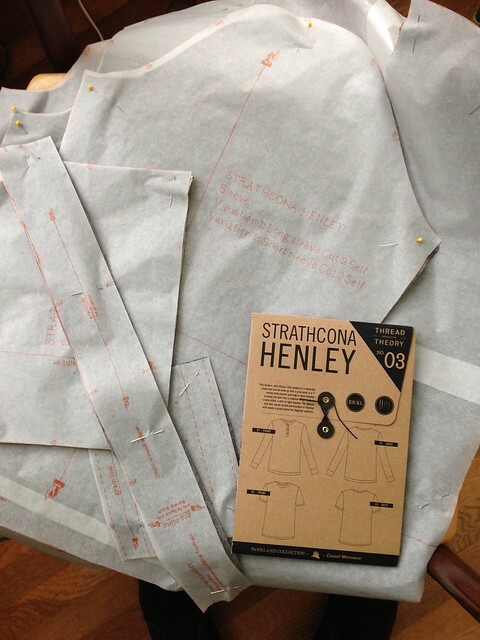 I Made My Husband a Thread Theory Strathcona Henley. 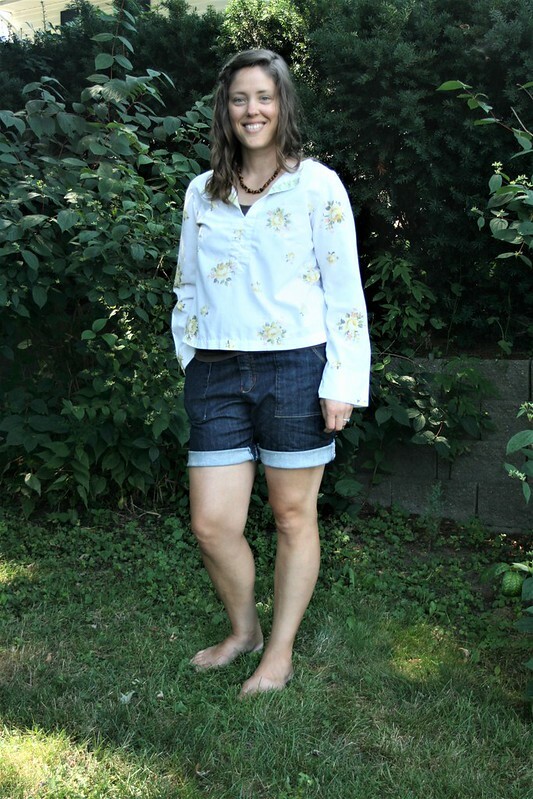 Before we get into this, I will say that this little bit of unselfish sewing (plus a shirt I sewed for my daughter AND pants for my husband…yes–MORE THAN ONE UNSELFISH PROJECT!) got me thinking. Why do I make most of my clothing for myself? Well, besides the fact that it’s fun and I like clothes, there is the reality that when you sew for someone else (or make anything for someone else), you have to work in a different way. 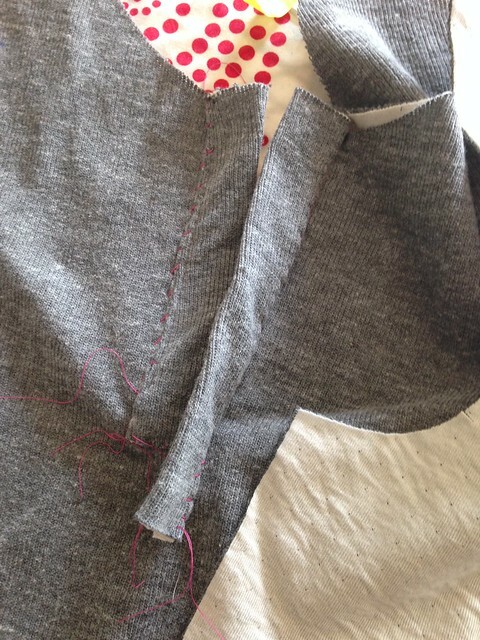 If I’m making a garment for myself and I make a mistake, I can decide if I care enough to fix it. Sometimes I do, often I don’t. I prefer to finish things over having them remain a perfect but unfinished project forever. Making something for someone else (especially if there is money involved) means I have to work to a different standard. I still have to finish the project AND it has to be at a higher level. If picky people are involved, it goes to a whole new level, which is why I try to avoid sewing for those who are hard to please. 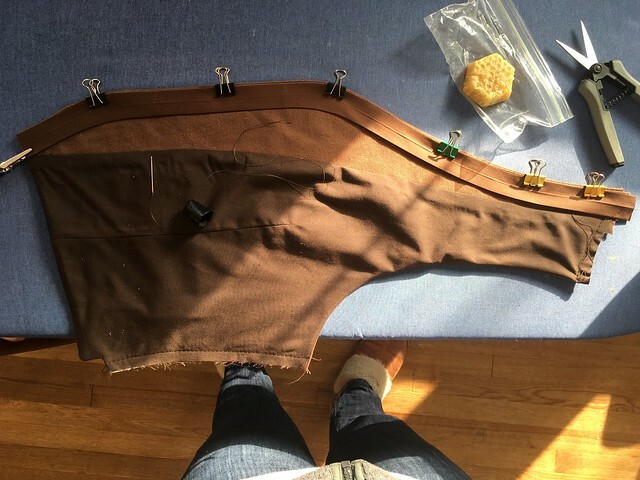 Even when sewing for someone who is not super picky, if the fit is off or they weren’t honest about what they really wanted, all your hard work ends up in a closet. In the garment I’m going to show you, there are some mistakes, but I think my husband, being the awesome encourager that he is and actually wanting a finished garment, went with “imperfectly finished is better than perfectly unfinished forever”. 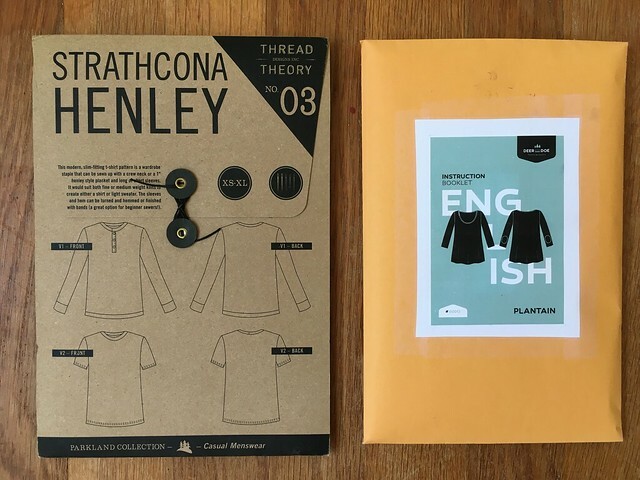 Let’s talk about the Strathcona Henley by Thread Theory! 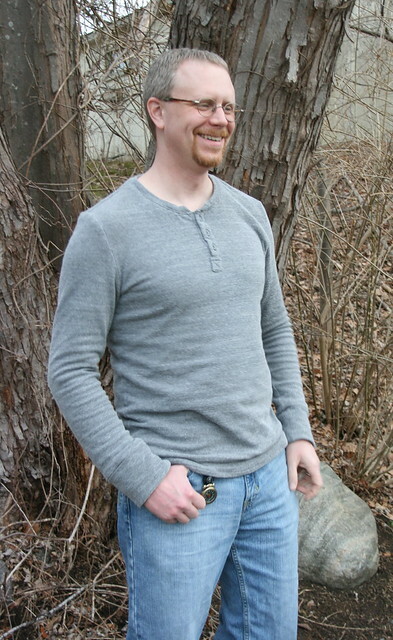 I LOVE Henleys for both men and women. 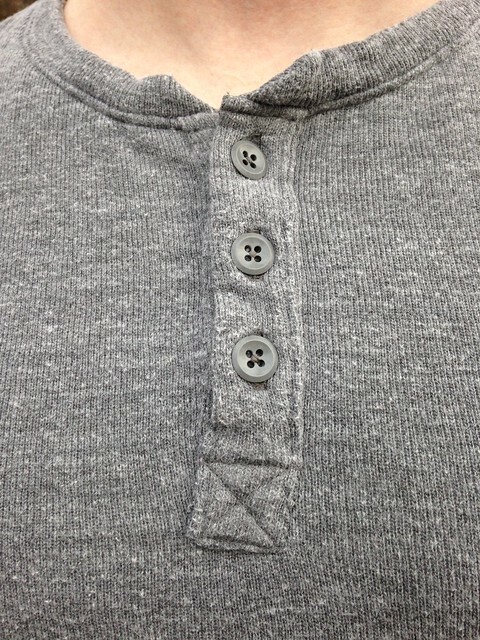 A Henley, as I understand it, is sort of like a t-shirt, but with a partial button placket down the front. 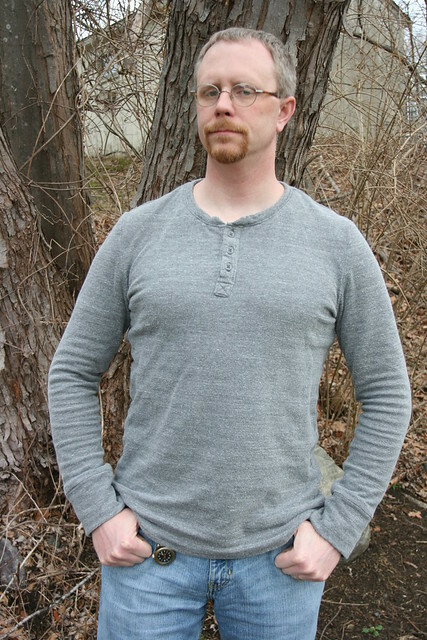 This type of shirt is made from a knit and has a certain “woodsman” vibe. Thread Theory really has that vibe down, making it possible for me to make L.L. Bean style clothes to my own preferences. 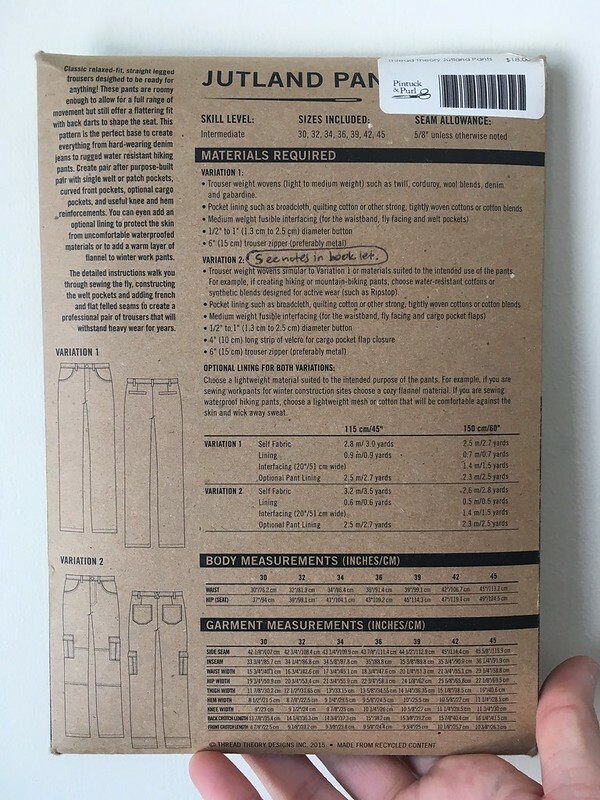 Also, these guys get a gold star for coolest packaging ever, even including a Thread Theory tag so you can sew it into your finished projects. 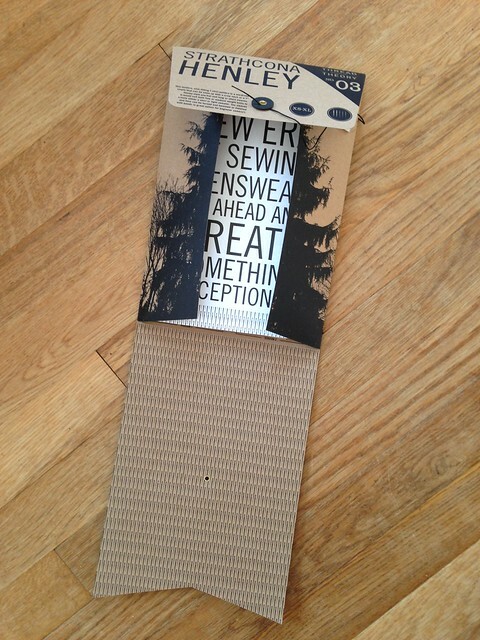 This year my one Black Friday purchase was a cool, double layer knit fabric from Cali Fabrics. 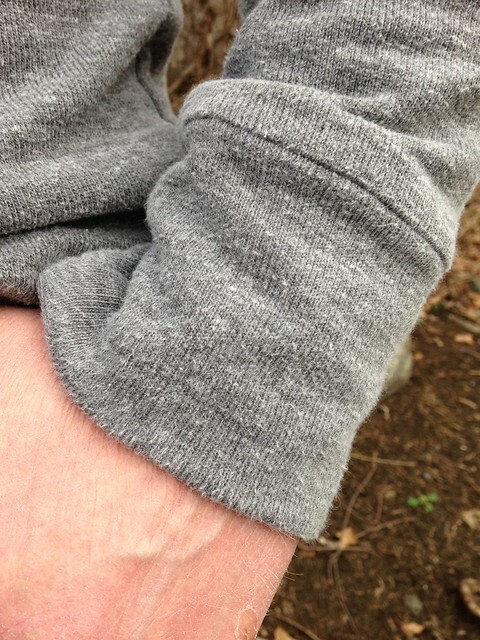 The outside is a grey rib knit and the inside is a soft off-white jersey. The two layers are tacked together every so often making them work as one. (I don’t see it on their site anymore, so I’m guessing it’s sold out.) 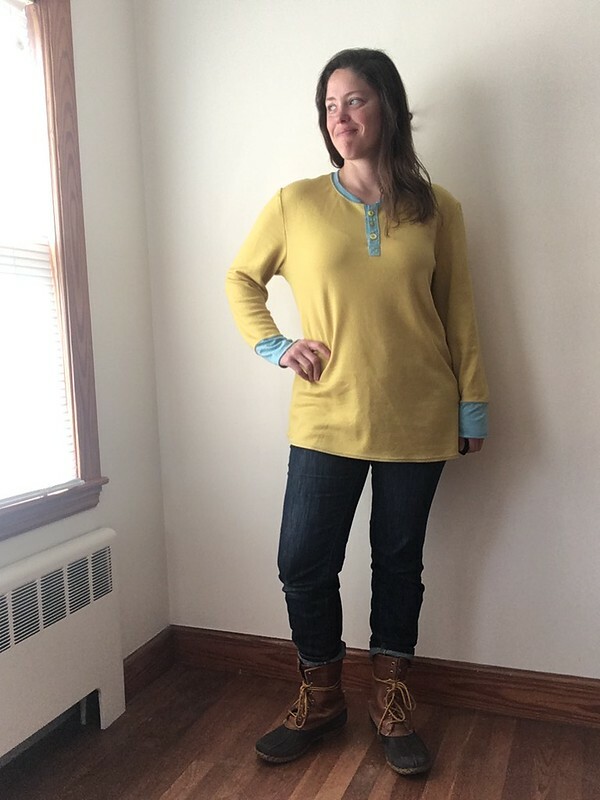 The garment pattern came from Pintuck & Purl in Exeter, NH. 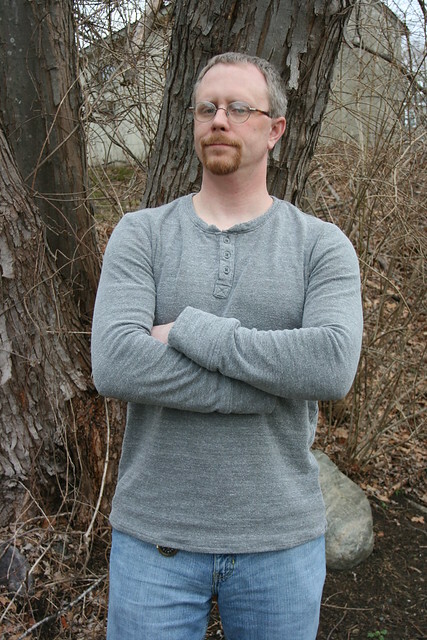 I made Scott Variation 1 of the Strathcona Henley. His measurements put him at a size Large, but since this is designed to be slim-fitting and he likes more ease in his clothing, I sized up to an extra-large. 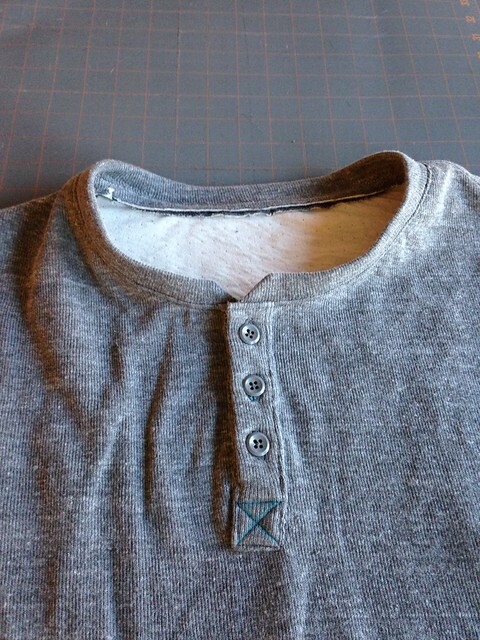 I’ve never sewn a Henley before, so I was hoping this wouldn’t be too tricky. 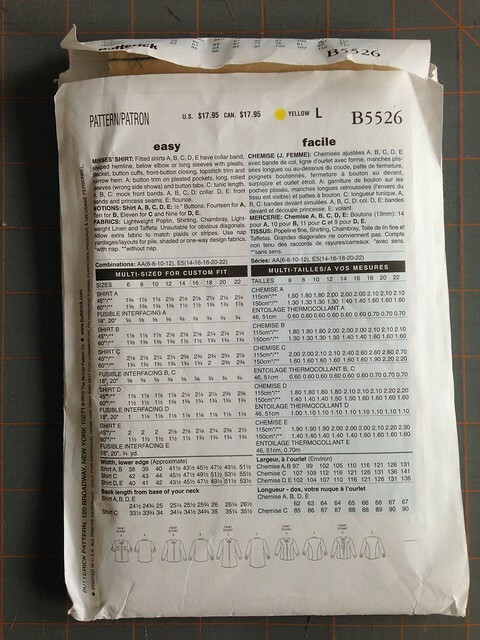 There is a lot of helpful information in the pattern booklet, including width and length suggestions for your zig-zag stitch. 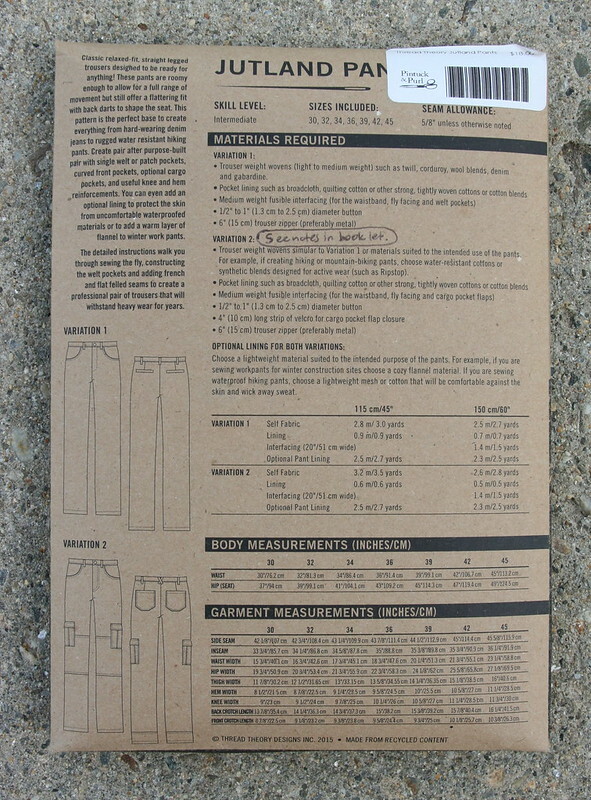 I ended up using a height of 2.5 and a length of 1 with a jersey needle and a walking foot on a standard sewing machine. 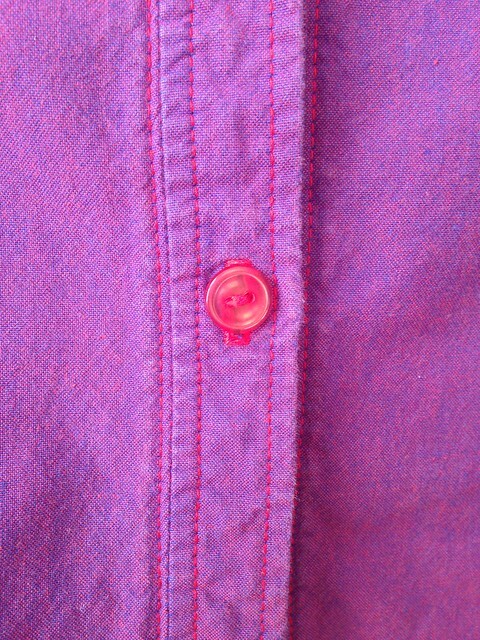 I found the button placket a little bit tricky (and frustrating) to do. Since I’ve never done this type of thing before, I chalk that up to my own inexperience. Perseverance paid off in the end, though. 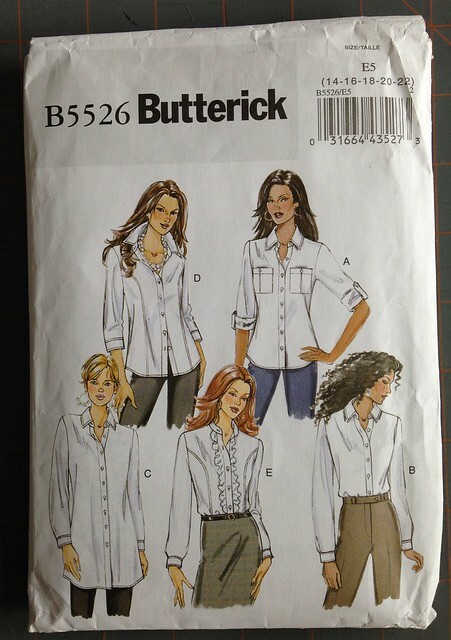 If you make this yourself, you should definitely hand-baste the placket in place as suggested. Just hand-baste everything! The square at the bottom of my placket came out crooked, but that was one of those mistakes that you look at and move on. My husband actually didn’t notice it until I mentioned it. (Oops!) I also think that my fabric, which was bulkier than a single layer would be, made things more difficult. If I make a billion of these, I’ll have to report back on if this gets easier. If you haven’t done this before, don’t be put off. If I can do it, so can you! You can’t expect your first time going through a technique to be perfect. If it turns out perfect, great, but expect it to be imperfect. You’re learning. 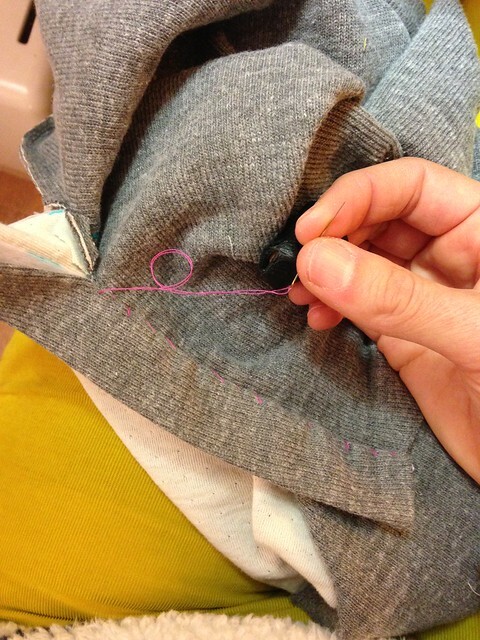 One really great thing about Thread Theory is that they have a lot of tutorials and sew-alongs online. Morgan, one of the owners, is also very willing to answer questions. 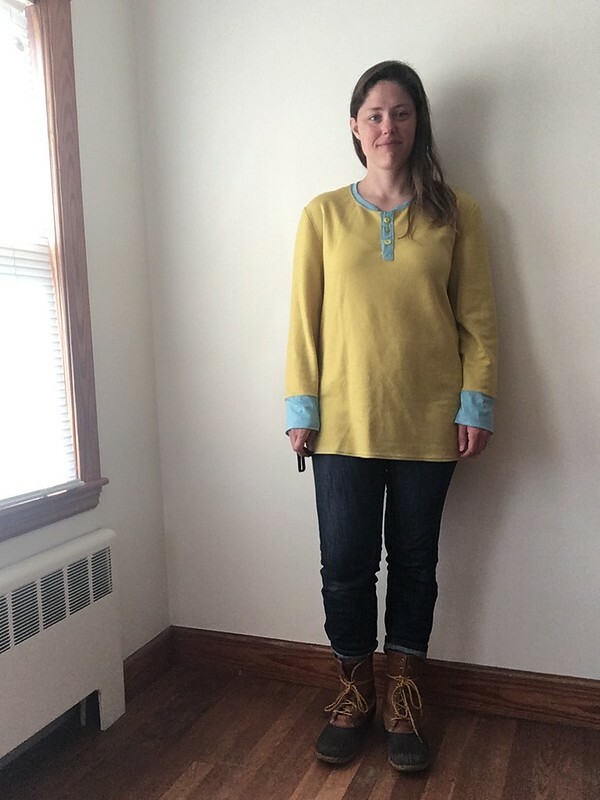 I didn’t email her about this project, but I did about another pattern (still to be blogged), and she was really helpful. Final analysis: I like this pattern, and it looks GOOD on my husband! You may not be able to tell from the pictures, since he rarely smiles in pictures, but he really likes it, too, and has worn it a lot. 😀 I LOVE how it turned out. I’ve even thought of adapting it to fit me, but that is for another sewing season. Cold weather sewing ended for me on Wednesday when I finished my last winter project. And look! I even got Scott to smile. Ha ha! Triumph! Smoothies! Here is our general recipe, adapted from one we found in a magazine ages ago: 1/4c. flavored low-fat yogurt (like peach or strawberry), a splash of milk, 1 Tablespoon of peanut butter, some strawberries (maybe 2 c.? ), a banana, a handful of ice, and maybe a handful of spinach (optional). Top with cinnamon and whipped cream (and sprinkles aren’t a bad idea, either!). Enjoy! This makes enough for one tall glass. I can usually triple it in my blender. Looking for an interesting source of fashion inspiration? If you are on Instagram, check out @artgarments to see fashion details found in paintings. If you have kids in your life and like cooperative games, try Outfoxed! by Gamewright. To beat the game, you all have to work together to uncover clues and reveal suspects until you have an idea of which fox stole the pot pie. If the fox escapes before you guess correctly, you lose! Have you ever watched “Marcel the Shell with Shoes On”? It’s so cute!